The 3rd edition of the Global Dressage Forum North America will be held in November 2016 at the Los Angeles Equestrian Center in Burbank CA. This much anticipated educational gathering will present some of the world's foremost dressage trainers, riders and educators in the world. Blow is a video of Ingrid Klimke with her appearance at the GDFNA in the past. The stars leading the 2nd GDFNA 2014 are International Judge and expert horseman Stephen Clarke, international rider Jan Brink, Sweden's super star Tinne Vilhelmson-Silven with Sweden's Olympic Coach Bo Jena, world renowned German dressage teacher Conrad Schumacher, dressage balance and German Educator Christoph Hess, Canada's super star 6 time Olympian Christilot Boylen with Germany's foremost dressage trainer Udo Lange. The Lecturers are: author of multiple books on correct riding Susanne von Dietze, Freestyle expert Terry Ciotti Gallo, equine movement expert Jochen Schleese and one of the Europe's most admired experts for centered riding Sue Leffler. The Panelists debating on stage with clinicians and lecturers were U.S. international rider and judge Charlotte Bredahl, world class horseman Volker Brommann, U.S. international trainers Kathy Connelly, Pam Goodrich, Anne Gribbons, Mette Rosencrantz, Betsy Steiner, George Williams, three time Olympian from Canada Leslie Reid along with the international ambassador for dressage education Arthur Kottas. One of the highlights of the GDFNA 2014 was the Life Time Dressage Achievement Award which is being awarded to FEI Dressage Judge General Stephen Clarke and this was presented to Mr. Clarke by U.S.D.F. President Mr. George Williams, Dressage Canada and the Dressage Foundations's Judith Noone.. The Global Dressage Forum North America 2014 presented the highest profile educational gathering ever to be held in North America encouraging every dressage rider from across the U.S. and Canada to come and participate in this educational gathering representing Dressage Education in its highest form. Dressageclinic.com is pleased to present Andreas Hausberger assisting Roberta Pollock aboard the 15 year-old gelding Orion training 3rd/4th level. Andreas brings his wisdom and experience as Fisrt Chief Rider of the Spanish Riding School of Vienna and Director of Training Centre in Heidenberg, Austria and offers insight on schooling techniques for developing high level movements. It is clear that his primary tools in schooling the piaffe and passage with this horse and rider pair is his ground schooling devices and his praise. Click Here to watch Andreas Hausberger schools the piaffe and passage using ground tools and praise. Watch Andreas school the piaffe and passage using ground tools and praise. Andreas uses two ground tools to coach the gelding into piaffe and passage from the ground – a long stick at the front of the horse to hold him back in moving forward in the piaffe, and the whip to add impulsion at the rear of the horse. Andreas positions himself on the ground at the shoulder of the horse and never misses a detail in providing the ground aids. He crosses the arena to meet Roberta at the long side to continue the training in piaffe offering guidance and uses his tools to coach the piaffe into even steps. Andreas repeatedly steps to the halted pair and pats the horse's neck to show his praise and affection for the horse’s behaviour. They continue training using the tools to coach the Passage with light taps on the lower hind legs of the horse. The taps brief and are quickly rewarded with a halt and treat by Andreas. The horse is calm and willing throughout the training. He quietly coaches Roberta into half passes and shoulder in then assists Roberta in the working pirouette from a 20 metre circle. Each collected canter has a working canter pirouette on the centre line with Andreas quietly schooling Roberta into even, relaxed canter movements. Half passes in the canter and transitions between working and collected canter precede the training. Finally, four, three and two tempis are briefly practiced and calmly and rhythmically executed. Andreas’s quiet coaching generates good progress in the piaffe and passage and produces a happy rider and horse while learning these difficult movements. In a classic case of nature versus nurture, dressage trainer and international competitor, Jessica Jo (JJ) Tate, examines exactly what makes horses tick. "We definitely have certain bloodlines (that naturally live to work). I have a Florestan that would literally run through fire for me if that meant doing a good job." However, Tate acknowledges that even though "certain bloodlines promote better listeners", developing horses with good work ethic is a much more complex process than simply good breeding. Sure bloodlines are a factor, but Tate says "I don't think that means though that other horses won't try." She believes that riders have a strong responsibility to shape their horse’s will to learn and perform. Much like a muscle that must be conditioned, Tate advocates that work ethic is built intentionally through a program based on positive reinforcement. "One of the biggest things that is important to me is that the horses feel good in the work and in themselves, and that they feel that the work makes them more confident, and more comfortable in their own skin. We have to give back to horses and make sure that our programs don't exploit them. They are such amazing, generous creatures. I think with proper education people can learn how to build up their horse to the best of their own abilities." According to Tate, horses that are willing to give their all in the show ring feel prepared physically and mentally, and are carefully monitored to prevent burnout. "When we talk about top level, world class riding you do have to be able to press that last five percent out of the horse, that's for sure, but I like to not squeeze that out of them every day. It's a little bit like a bank account. You have to put your deposits in before you spend the entire big amount. I tell my students that 'when you go to the horse show you're going to spend a lot in that bank account that you've built up' – and that's in both trust, and strength, – so I spend a lot of time during my week before the horse show and even after horse shows building up those important basics, and the horse's willingness to want to please me." For Tate, being mindful of a horse's mental state is an important aspect of developing a positive work ethic. It's a process that begins as soon as one comes in contact with a horse and never ends. In general, Tate has experienced that "when horses feel in your spirit that you are fair, and you've explained it, and you've made them strong enough to do it, they will want to do it for you." However, she concedes that horses who have had a difficult start to their riding careers for whatever reason (pain, poor training, etc. ), can respond with negative behaviors, and turning that around requires trainers to exercise some critical thinking. "Everyone can tell you the 'what', the thing that the horse is doing – it's rearing, it's spooking, or wants to run off with its head up – and to me it's interesting to figure out why does that horse want to do that? Is it pain related? Is it history? What has made it want to make these choices and how do I help it break that cycle?" Sometimes the best way to break a cycle with a horse is simply to back the pressure off. Tate explains, "If we get a horse that's been really mentally shut down then we do a lot of outside riding. So a lot of hills and ground poles. We make it fun again. What I really attempt to do is continue to work the horse's body in a beneficial way yet I take the pressure off of them mentally." Discovering how a horse processes their environment and what constitutes a positive "workplace" for them is the key to inspiring a horse to put forth their best effort says Tate. "I like getting into the horse's brain and exploring how I can convince a horse to do what I want, even if it's just starting in the round pen kind of playing with them. That has even brought some horses out of their shells which is really fun to see." When you determine the best reward for your horse Tate suggests using it to make the correct response to aids crystal clear. "There are some horses that are very food motivated so piece of sugar is great and they'll do anything for that. Some horses would rather just stop the exercise, so if I have one that's been a little soured the minute he does what I want I just drop the reins, pet him, and walk away" explains Tate. She recalls at times even going to extreme lengths to make sure that her horse knew he had done a good job. "I had one horse learning changes and when he did them I would pet him, give him a sugar, and hand walk him out of the ring. So you have to really know the horse. " When a horse comes to recognize their individual reward as a signal that they've chosen the correct "answer" to the rider's questions, they quickly become encouraged to offer possible responses even when prompted with new aids. With a horse that understands this pressure-and-release pattern Tate says, "you can often watch them go through their repertoire of 'how can I get the pressure off'? And if you can be really accurate with your timing and really positive when they do the right thing, that's where the really big learning moments come from." Tate continues, "I'm a real proponent of positive reinforcement. My mentor (Charles De Kunffy) would always say that horses don't understand punishment. They don't process that they made a mistake – their brains don't work that way. If they just accidentally lost their balance and picked up counter canter, or they lost the bend and broke into the trot, and we go smack, smack, smack with the whip, we are just scaring them into a reaction. Then they learn to live in fear of making a mistake, which makes them motivated in the wrong way. We always laugh that the horse should never know that the rider made a mistake. He's just doing what he thought you said." Lastly, for riders looking to entice that extra effort from their horse under saddle, Tate's final words of advice are to not be a stranger. It seems obvious that a rider should build a connection with their equine partners, but it's such an important component that it cannot be overlooked. "I want to have a relationship with the horse" says Tate. This becomes even more important if she encounters a new horse with trust issues, or an aversion to work. "I would stay late in the evening and either hand graze it myself or groom them to establish some type of bond." Above anything Tate hopes that her presence elicits a positive reaction from her horses. "I want to walk in the barn and have them stick their heads out, you know. Now half of them whinny to me!" It's in these moments between horse and rider that Tate believes talent takes shape, when a team is formed, and that special x-factor is born, thrusting good horses into greatness. She says, "I find that when I have a horse that digs deep not because they are afraid of me, but because I inspire them to want to do well for me – I get 100 times more from those horses." Katie Jackson and Royal Dancer competing at the 2017 Adequan Global Dressage Festival. Jackson will compete Jan 4-7, 2018 at the Global Dressage Festival showgrounds alongside 18 other horse and rider combinations. Wellington, Florida – January 4, 2018 – Nineteen horse and rider combinations braved the unusual cold weather at the FEI Horse Inspection at Week 0 of the 2018 Adequan Global Dressage Festival (AGDF) CPEDI3*. Kicking off the winter season at the Global Dressage Festival in Wellington, Florida, these pairs will make their way down centerline through Sunday, January 7. Riders from the USA and Canada can expect a second chilly day on Friday as they showcase their Team Tests for FEI Ground Jury Dr Jan-Holger Holtschmit (GER), Kristi Wysocki (USA), and Sarah Leitch (GBR). The 2018 AGDF CPEDI3* January 4-7, is the first of two (Week Two is January 18-21) international Para-Dressage shows held in Wellington this season. Both shows are sponsored by By Mission Control, Rowan O’Riley supporting athletes in the USPEA and US Equestrian, and Cargill. Para-Dressage riders are using these multiple opportunities to prepare for the exciting FEI World Equestrian Games™ Tryon 2018 held in Mill Spring, North Carolina, U.S. at the Tryon International Equestrian Center, from September 11-September 23. Nine of Britain’s best Small Tour combinations competed in last night’s inaugural Inter I Freestyle Invitational, supported by Equitop Myoplast, at the Liverpool International Horse Show. It proved to be a fitting finale to the Festive Season when the eagerly awaited debut of Carl Hester and his Tokyo prospect Hawtins Delicato proved to be a winning one. Drawn last to go under the late night lights of the Echo Arena, Carl and the British bred ‘Del’, by Diamond Hit, wowed the crowds with a performance bursting with promise. It’s the first time they’ve shown together as the nine year old has been lightly competed so far by Charlotte Dujardin. Judges Peter Storr (C) and Stephen Clarke (E) were suitably impressed and awarded the duo 80.5% with both judges awarding eight for difficulty – quite a score for a young horse. Reflecting on Hawtins Delicato’s performance, Carl commented: “It was the first time I had ridden him in a competition. I have been part of his life for four years, and for next year we are trying to qualify him for the World Games. On Facebook Carl wrote afterwards; “Nice to see my protégée on my right for a change!” His pupil wasn’t far behind in second on her rising star, En Vogue by Jazz with a score of 78.68%. At just eight, Vogue was one of the youngest in the field but Charlotte knows the black gelding is one for the future and this was a test of his temperament and training which he answered brilliantly. She said; “”I was absolutely delighted with the performance,” she said. “That was his first freestyle, and he has never been in an environment like that, ever. “He was so wild when I got him – I’ve had him for five years – and he is looking so promising for next year to be a grand prix horse. Third spot went to ‘local rider’ and UKCC Level 3 coach Sarah Higgins from Cheshire and the 13 year old Waldessarini, owned by Sarah Rao, on 73.75%, who was clearly thrilled to be sharing a podium with two Olympians. Carl was clearly impressed with the latest top class venue and show to host dressage;”It is an absolutely superb show. I had never even been to Liverpool, let alone the show. It’s such a spectacular place – the arena is incredible. 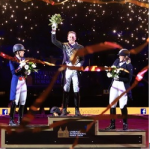 “I didn’t think that Olympia (London International Horse Show) would ever be matched for an atmosphere, but I think we can honestly say that this event was also an awesome occasion. It was great to see so many children in the audience, especially. “This is a huge atmosphere for dressage horses at Liverpool. Jumping horses can go in these sort of atmospheres all the time, but it’s so difficult to get exposure for these young up and coming horses for their future, so it has been an amazing experience to have both my horse and Charlotte’s horse at Liverpool. Dressageclinic.com is pleased to present this demonstration with well-respected Equine MassageTherapist Sal Salvetti lecturing on the art of equine massage. Sal has an extensive client list. His specialty is the dressage athlete and provides an in depth lecture on keeping our high performance horses sound. Sal works on Savoie Faire, a 12 year old KWPN FEI horse by Contango and shares important information and techniques while he massages and stretches the horse’s muscles. Watch Sal Salvetti lecture on massage techniques. Sal shares that it takes a village of people like veterinarians, riders, trainers, chiropractors, farriers and often a massage therapist to keep our horses performing. Here are Sal’s top wisdoms when massaging horses. Sal encourages us to consider touching our horses and working with their body. Sal begins each massage on the left side working on the neck to familiarize the horse with you and what you are doing. “As a horse owner, you should feel comfortable to do anything like this with your horse.” Sal feels it’s important we work with our horses’ bodies and to move the entire structure not simply massaging specific muscles. Sal explains that he works with horses in their stalls – never in cross ties. He reminds us that deep tissue massage can feel painful, pleasurable, or anything in between. “It’s important for your horse to give feedback,” says Sal. “The beautiful thing with working with horses – what makes it so easy – is the feedback that they give is pure, it’s instantaneous, it’s unfiltered,” says Sal. Giving horses freedom to respond allows them to express themselves. As well, Sal says the horse will often position themselves on their own to optimize what you are doing. Sal demonstrates many stretching exercises, which he routinely employs in his massage work. He shares that are many ways to stretch the horse incorrectly and advises us to always stretch horses on a soft surface to protect the lower limb if it slips and hits the ground. Sal wants the horses to feel secure and supported and strongly advises never to drop the limb and to do your best to slow the impact if the horse does pull it out of your grasp. When your horse is showing signs of tension, pain, or has a change in performance, an equine massage therapist may need to step in. Watching Sal and listening to his wisdom brings us all a step closer in learning how we can keep our high performance horses happy, loose, and sound. Excellent work Sal. 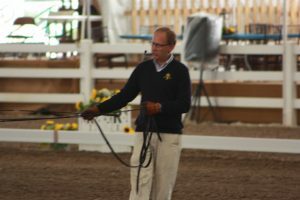 Dressageclinic.com is pleased to present this in-depth interview with well-respected trainer Volker Brommann discussing all aspects of lateral work from leg yield to shoulder-in, renvers to travers, and the half-pass. DressageClinic.com Executive Director Andreas Stano leads the discussion in this video which provides a foundation of understanding for riders, coaches, and judges who are looking to clarify the aids for riding the lateral movements. Watch Volker's interview discussing all aspects of lateral work. Here are the top highlights of Volker’s interview. Volker believes in the leg yield and rides the leg yield before performing shoulder-in or half-pass. “It gives me a very good baseline if the horse is on my inside and outside aids,” says Volker. Volker explains how he adjusts leg aids or adds tools, such as the whip, to get the desired response. He also provides several solutions to various problems when training the leg yield. 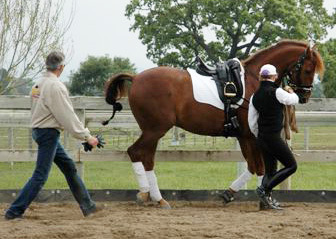 Shoulder-in is performed with a horse that is bent and is very similar to riding a corner. Volker shares the elements of travers, where the haunches are to the inside. 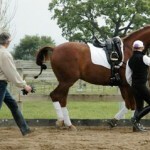 Volker uses the leg yield aids along the wall and begins by simply changing the flexion of the horse. He then returns to the circle to create the bend. He adjusts his leg aids to ensure the horse does not fall in or out and also adjusts his weight towards the direction of travel. He continues to use all these adjustments to refine the movement. Renvers, haunches to the outside, has equal yet opposite aids. Volker shares the benefits of schooling renvers and shoulder-in sequentially and reminds us to adjust our weight towards the bend of the horse. 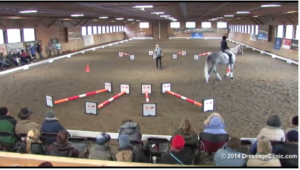 Volker explains that the half-pass has similar aids and movement of the travers but is instead performed across the arena. 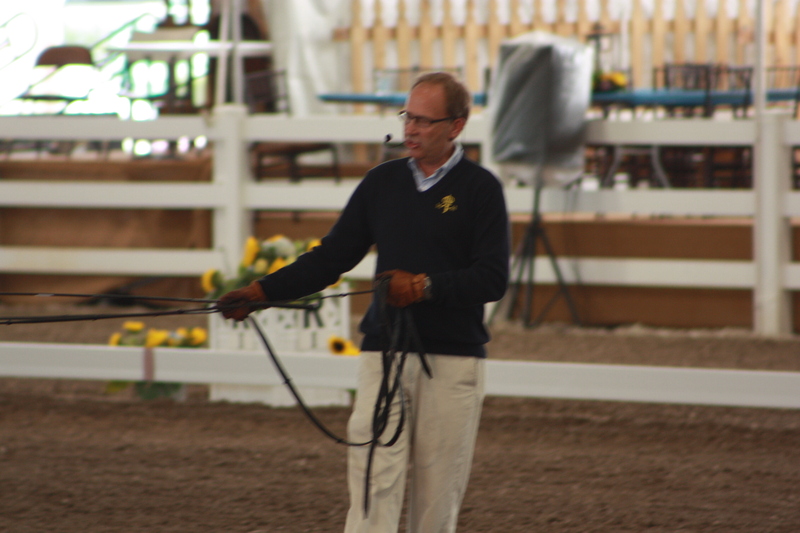 Volker shares that the movement must be forward and it is important that the horse is leading with the forehand. Volker takes his time in sharing his dressage journey and clearly lays out the elements that produce correct lateral movements. Thank you Volker for sharing your knowledge. Dressageclinic.com is pleased to present author, speaker, and well-respected Equestrian Psychologist Laura King who is the New York Times Best-selling author of the book ‘Power to Win’. Gifted in helping riders achieve their best, Laura uses her background in psychology and training in hypnotherapy and neuro-linguistic programming to unlock our potential. Laura’s speech is a must for those riders who are looking for the tools that keep them thinking and riding their best. Watch Laura speak on the power of the subconscious mind to improve our thinking and riding. Laura’s opens her address to the dressage audience with the statement that hypnosis is extremely powerful allowing us to access and program 88% of our subconscious mind by relaxation. Laura now speaks to hundreds of people on the power of the mind and shares the tools that can help us change our thoughts and, ultimately, our behaviours. “The only person who that is in control of your thoughts is yourself, but you have to learn how to think those positive thoughts,” shares Laura who uses hypnosis to access the subconscious and program in new, more beneficial thinking to riders. Laura explains that what we think ultimately produces the life we live. Laura shares that our beliefs or the thoughts we think, whether they are true or not, lead to a feeling and then to a physical reaction. Here are some tools and techniques that Laura uses to teach riders to stay positive in the mind and perform your best in the saddle. Laura explains that the subconscious mind does not hear the words ‘don’t or ‘not’. Statements such as ‘I’m not going to miss that lead change’ in fact is heard by the brain as ‘I’m going to miss that lead change’ and you end up doing what you told yourself not to do. Laura encourages us to use language that is clear so that the subconscious can clearly act on it. Laura also uses anchors to coach her riders to easily, automatically, and naturally change their mental and physical state. Anchors like stop lights guide us into a behaviour we perform without thought. Using anchoring words like “FOCUS” or “BREATHE” can instantly influence the rider’s mind and body. Once the habit is formed, these anchoring words can be transformative. “To our subconscious brain, our imagination is as strong as knowledge,” says Laura. She encourages the audience to close their eyes and imagine sitting in your saddle riding your horse just like your role model – someone you really admire. “You can actually reprogram your subconscious mind,” says Laura. Forming a new roadmap and using your imagination to re-identifying yourself can help bring you closer to the best rider you can be. 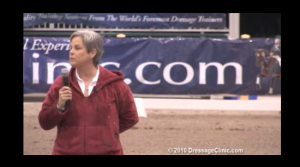 To watch all of Laura King’s deeply transformative videos on DressageClinic.com, click here. Dressageclinic.com is pleased to present renound and respected FEI Judge General Stephen Clarke, providing Jan Ebeling valuable test score feedback while riding 11-year-old Breitan, a Hanoverian Stallion, at the West Coast Trainers Conference. Watch Stephen Clarke provide real-time feedback to Jan Ebeling aboard Breitan at the West Coast Trainers Conference. Every dressage rider values honest, helpful feedback from the ground and Stephen Clarke is one of the best in assessing a dressage test to improve and develop the horse and rider. This video captures Stephen doing what he does best: scoring FEI dressage tests with honesty, kindness, and some humor. As FEI Judge General, he has earned the honour of leading dressage evaluation teams and his years of experience evaluating riders is demonstrated in this video with Jan Ebeling and Breitan. As an audience of dressage enthusiasts watch the test unfold, Stephen shares his thoughts on the test as each movement is executed, often giving scores to allow the audience to see his standard of evaluation. Stephen offers his insight on what makes a movement a score of 7 (or good) to 8 (fairly good) and finally a 9 (very good). Stephen comments on the horse's responsiveness to the aids and elements of the piaffe, passage, pirouettes and extended trots that earn top marks from FEI judges. As the ride continues, Stephen asks the piaffe steps to be repeated to ensure the horse learns and improves. "That’s the value of doing it in this situation. In a real competition, you have no choice but to carry on. But this is a schooling test." As a result, Jan rides the piaffe a second time and improves Breitan's response. Stephen's insight as Jan rides provides everyone a clear understanding of the evaluation standards of FEI level dressage. Stephen also offers reassuring advice on managing the piaffe expectations going forward into competion. "I think you have shown him that it is possible to do it in a test. It’s only my personal thought but I wouldn’t be looking to go for a high mark," says Stephen. "As long as you know that here is genuine reaction and that he is there doing it really for himself, than you have a future." Stephen ends the evaluation on a wonderful note. “Good halt. Very good. Well done. That was super Jan." What more could you want from an FEI Judge. Riders and trainers understand the importance of sound footing for performance horses to keep horses successful in their training. 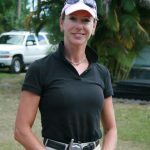 Dressageclinic.com is pleased to have had a rare interview with Footing Solutions consultant Hilo Nick who travels around the world building arena footing. Watch a segment of the Interview with Hilo Nick discussing arena footing. On this rare occasion, Hilo stands on a newly completed 16,000 square foot indoor dressage arena where a crew took four days to install a drip watering system within a grid base and then another four days adding silica sand with geotextiles on top. The result is a world-class riding surface that maintains the perfect moisture and resists decomposition. “All we are trying to do is copy the structure of turf, “ says Hilo. This interview takes place in British Columbia, Canada where Hilo shares her 5 considerations when it comes to footing. Hilo explains the variety of soft tissue injuries that occur with deep, unstable footing. Conversely, a hard, unforgiving surface can cause splints and jarring of joints. Slippery surfaces can cause horses to loose confidence and dusty environments can impact respiratory health. In this arena, Hilo shows the grid system that is placed under the mixture of sand. “It is a life long separation layer between your base and your sand.” The flexible grid adds “bounce” and prevents subsoil materials like rocks and clay from migrating to the surface. Hilo explains that her top choice of footing material is silica sand. She shares that silica sand is a very hard sand but it does not decompose or decay into stone dust. “Even if it were to get dry, it would never get dusty”. It has a very long life and it never changes it’s structure. Other sands such as concrete and river sand are not as resilient and organic materials like sawdust and wood chips will break down over time. Geotextiles are now a common additive to arenas. “Selection has to be done very carefully,” says Hilo. “We like the one with a thick fuzzy looking polyester felt.” The felt provides both cushioning as well as the fibers release over time and knit and hold the sand together much like turf. Hilo reminds us to consider expert advice when considering your arena footing and maintains that there are solutions for every budget using any footing material. Thank you Hilo for your invaluable knowledge. To watch the full interview with Hilo Nick, click here. The first ever 2013 Global Dressage Forum hosted at the spectacular Pineland Equestrian Centre in Wellington, Florida brought hundreds of dressage riders, trainers and enthusiasts together to learn in the most significant educational gathering in North America. The event provided a lecture stage as well as an arena for the best trainers and riders to share their knowledge with panalists Anne Gribbons, Felicitas von Neumann, Cathy Connolly, Betsy Steiner, Leslie Reid, and Jan Ebeling. The agenda for the event covered interviews and discussions with top riders Steffen Peters and Ingrid Klimke. Besides sharing their experiences training their top mounts, Steffen and Ingrid also lectured aboard horses during the forum. The entire forum is professionally recorded then edited and archived by event. Each event is labeled and can easily selected depending on the interest of the viewer. Highlights of the event include Klaus Balkenhol receiving a lifetime Dressage Achievement Award sharing is pride in contributing to the sport, Bo Jena provided training and instruction on long lining techniques, which were demonstrated in front of the forum audience, and Ingrid Klimke captured the attention of the crowd by narrating her Olympic ride in the cross country event in London. Ingrid also shared her theories, philosophies, and training methods of her horses. Additional educational lectures were provided by Dr. Hilary Clayton who provided a lecture on the development of the dressage horse, Dr. Juan Samper on breeding dressage horses, Grant Moon on specialty farrier work, as well as discussions by Stefan Stammer and Wolfram Wittig on the sport of dressage. The event was an overwhelming success in providing educational opportunties for all that attended the event. These valuable recordings of this spectactular forum will no doubt continue to educate the global dressage community. For access to the video archive of the 2013 Global Dressage Forum, click here. One of Holland’s Top International Trainers… Leunis Van Lieren Brings Playfulness to 5 year-old Hexagon’s 3rd and 4th Level Training. Dressageclinic.com is pleased to present this video of Leunis Van Lieren, a well-known developer of many grand prix horses who often focuses his time training his own homebred stock in the Netherlands. Hexagon, a 5 year-old gelding, is one of Leunis’ horses that progresses well in his training as Leunis shows what he can do in a double bridle completing 3rd and 4th level movements. Leunis Van Lieren Riding and Lecturing on Hexagon, a 5 year-old KWPN gelding at 3rd-4th Level. The training with Hexagon is done in a very short time as Leunis ensures Hexagon is never tiring in the work. Leunis explains that most people tire their horses before they do the work and that is when injuries occur. “As soon as he is not fresh anymore, I quit working,” he says. Leunis is confident that because of this diligence in ensuring his horses stop working before they get tired, he can assure that they will remain healthy and away from injuries towards grand prix. And in 16 minutes Leunis brings Hexagon from travere into halfpasses and extended trots and even some willing passage and piaffe steps inbetween canter work. In the end, Hexagon is far from tired. This is certainly an exciting and talented horse and proven rider to follow to grand prix. Congratulations to Leunis for breeding the talented horse and ensuring his grand prix career is protected by keeping him fresh while developing him with playfulness. Something that we all should learn from. It is a technique to teach horses to enjoy their work, Good riders make horses content, bad riders with bad habits, make horses sour and unwilling, Sign up now and truly enter the international world of training horses to the FEI levels. Leonie Bramall’s Mental Mindset Tips for Riding Horses in Training: This Training Video is Aboard an 8-year-old Hanoverian Gelding Training at 4th level. If you HAD a membership in the past, your information still exists, so just re-activate your old membership by Signing In with your old Username and Password. 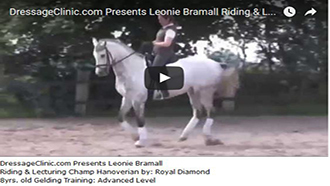 DressageClinic.com proud to present one of the most highly experienced and knowledable German trainers, Leonie Bramall, aboard an 8-year-old Hanoverian gelding at 4th level. This video has Leonie riding and lecturing various upper level movements while at the same time explaining the importance of the mental mindset needed for the rider and horse to achieve progress at this level. Leonie places high value on walking the horse. “I like to walk my horses a lot before I start into the work.” Often her horses walk long and low for 15 minutes. This allows the horse to adjust to the environment, the rider to tune into the horse’s stride and attitude, and it prepares the horse’s body for the work at hand. Leonie reminds us to "ride into the future" by constantly monitoring the horse’s responses to aids. “I can only change what is coming. I can’t change what’s happened. I can learn what has happened, but I can’t change that.” This philosophy will keep you humble and honest in your training of horses and focuse on your attention on influencing the future. Central to riding is preparing the horse both mentally and physically. “It is important to get his mind and his body in a good space to prepare him for the next piece of work.” With that, Leonie ensures her cues and commands are clear. “He can’t read my mind,” says Leonie. “I must prepare him and let him know something is going to happen.” Leonie believes this is vital in controlling the whole horse. “Try to keep your horse’s motivation,” says Leonie. “Not making the horse tired and riding to the point where the horse is just exhausting itself.” Leonie includes numerous walk breaks in her ride and explains that you do not want the horse to dread your requests. The management of the horse’s motivation keeps him happy and ready to work. Leonie also is aware of how strong the horse is for the work. “We have changed the concept so that we are working on strengthening.” Leonie works the horse a few times a week focusing on improving his capacity for work. Knowing the horse’s limits is critical in keeping the horse happy and sound. Leonie emphasizes being happy with small steps. When training a client horse, small gains is the goal. She reminds us that each horse comes with various levels of talent, training, and history of riders over their lifetime. Remember that you are there to help teach the horse by obtaining that relatxation both in the body and in the mind. “You must not ride with baggage. You must not ride with negative emotion.” Leonie is emphatic on riding with a fresh mind. Coming in to each ride with a neutral open mindset allows the rider to see what the horse is offering. “Give the horse the benefit of the doubt.” This allows for adjusting the training based on the horse’s needs. Leonie Bramall shares her knowledge on the mental mindset that makes for a good rider of any horse. Thank you Leonie. What a fantastic, informative and knowledgable lecture, This is such an importatn video for the development of any serious dressage rider, it must be viewed, not just once but many times over and over again as each time you will watch this video, you will hear new things and new concepts that you had missed before. DressageClinic.com has the unique privilege of bringing to you the world famous trainer and competitor, Micheal Klimke, son of the great Dr Reiner Klimke. 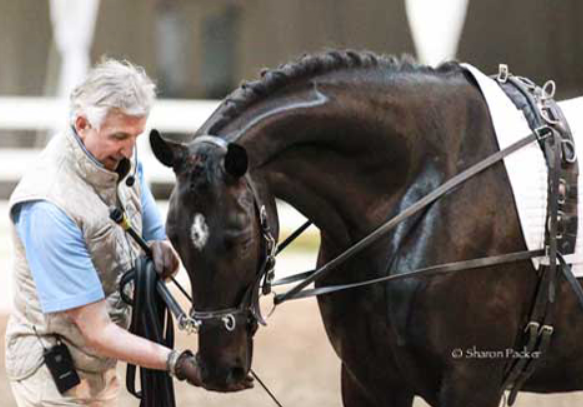 Michael Klimke is one of Germany's most in demand trainers and is well known for his amazing ability to develop top horses and riders and most noted for his enthusiastic clinics which he conducts all over the world. He brings to his students an incredible depth of knowledge and skill which he is able to share with amazing effectiveness. This video is a demonstration of beautiful riding and great horsemanship. 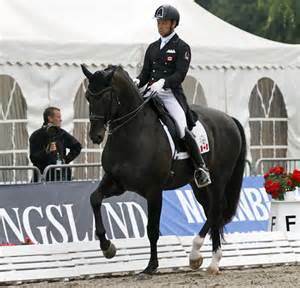 It really shows viewers why Michael Klimke is considered one the best in the world at developing the dressage horse. In this over thirty minute video, Klimke is riding and lecturing on the beautiful Oldenberg mare Biert’s Biene, who is by the great Trakehner stallion, Biotop. 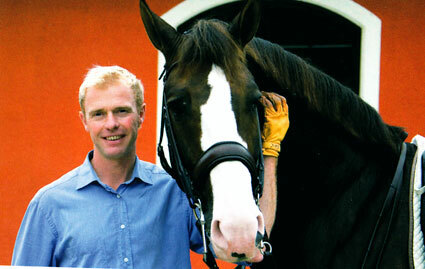 Biotop was Dr Klimke’s last competition horse before his passing in 1999. At the time of this session Biert’s Biene is 8 years old and schooling 4th level. Michael is starting her preparation for Prix St George and we are invited to follow the steps Klimke is taking with this talented and “not always easy” young mare. It is an added bonus that Klimke has been working with this horse since she started under saddle as a three year old. This gives him an intimate grasp of Biert’s Biene and their complicity is valuable education for all dressage riders to see and this training sessions gives viewers a rare opportunity to learn how to work with mares and how to follow the correct steps in preparing the horse for the upper levels. Michael explains the principles and reasons behind everything he does during his ride. His warm up is thorough and effective and very well explained. He is an effective rider and a wonderful lecturer. He explains to viewers how to “just enjoy it, and if the rider enjoys it, then the horse can enjoy his development”. His riding is amazingly calm, quiet and effective. Michael Klimke explains he wants a horse that is “always willing to go forward”. The use of the rider’s aids as well as the reins is covered in depth throughout every exercise during this session. We watch lovely work in the half pass and pirouette while being treated to clear honest analysis of their performance from Klimke. Any problems during the ride are dealt with poise and skill. It is exciting to bear witness to the beginnings of their half steps and passage especially with such a great master sharing his secrets for success. Viewers really get the inside scoop and should not miss this one! the saddle are an inspiration for all riders of all levels. Be sure to take this wonderful opportunity to learn with such a world class horseman! Michael Klimke is one of the children of the late Dr. Reiner Klimke who was one of the greatest proponents of classical dressage training. Michael, himself, is a trainer and educator that has a true passion for the correct training of the dressage horse. He is noted for bringing his horses up through the young horse ranks to becoming International Grand Prix competitors. Michael has had a very notable career having competed at the 1996 World Cup, was the reserve rider at the 2000 Olympics in Sydney and in the same year became the German National Champions. 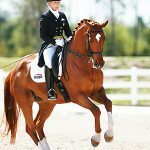 Dressageclinic.com is pleased to present this training video with Kathy Connelly, a woman who needs little introduction in the dressage world. Her experiences in Europe and all over the U.S. and around the world aboard top horses, her coaching, guidance of many FEI level riders. Her involvement with the U.S. Team in international arenas has created a wisdom within her which is sought out among many serious dressage riders. This video is for the rider who wants to gain thrust, lightness, and forward movement in their upper level horses and Kathy instruction and advise to bring that about in her rider. She values the horse that moves with an ‘uphill attitude’. In this video, Kathy coaches Sarah Diggin aboard Don Camillo a lovely 11 year-old Westphalian Gelding schooling Prix St. Georges. Sarah, a devoted rider scoring 67 and 70 in her recent tests, shares her enthusiasm for continuing her journey in the development and establishment of quality dressage training with Kathy. Kathy coaxes forth the ‘electric energy’ she wants to see coming from Sarah’s horse. She guides Sarah to move her horse with a mindset of thinking ‘forward’. Kathy also shares that forwardness is a result of two elements. It is a combination of positive tension with relaxation. Getting the right balance of both positive tension and relaxation is the art of achieving ‘electric lightness’. Through out this 33-minute training video, Kathy uses her visualizations, descriptions and examples to Sarah to bring this electric lightness to the ride. Kathy also brings her knowledge into the training ring when she adds an aid from the ground: a neutrally held lunge whip to bring that energy willingly out of the gelding. 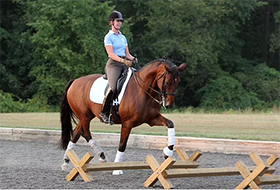 Kathy’s vast experience and wisdom in training horses and coaching riders come forth in this focused session with Sarah which include lateral work, tempis, and canter half-passes all with electric lightness. The work is brief yet effective. Kathy works well with Sarah to get the job done which include upper level work with an energetic, forward horse. Super. If you care about yourself as a dressage rider and want to improve your understanding for the development of yourself and your horse, watch this video. If you HAD a membership in the past your information still exists so just re-activate your old membership by signing in with your old Username and Password. Dressageclinic.com is proud to present this informative video with Johann Rockx, riding Verdi De La Fazenda, a KWPN 9 year-old-gelding sharing how he’s polishing grand prix movements on this talented horse. Johann’s intention with Verdi is to have this horse completing his work in a supple and balanced frame. Johann begins working Verdi with little support with light contact testing that he is not hanging on his hands. Johann asks Verdi while trotting to demonstrate his suppleness. He tests for blockings in the horse’s body. Throughout the warm-up, Johann diagnoses Verdi’s suppleness by riding Verdi into a series of gymnastic moments that collect and bend the horse. “I try to get rid of all the blockings in his body and to keep the swing in his body,” he explains. “Sometimes if he tries to get support, I catch him lightly and he relaxes and then I can have the feeling that I can open my hand.” Johann constantly tests with his hands to ensure the horse is ‘on his own legs’. Johann knows that when he opens his hands and the horse follows the bit down and keeps his balance, he is ready to ask for higher level movements. 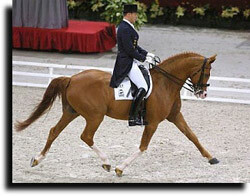 Finally, piaffe steps are practiced where Johann adds the dressage whip as an aid. “Maybe I don’t need it, but maybe I can just make him a little bit fresher.” The work yields relaxed, powerful collected steps. Again Johann keeps asking Verdi for lightness and suppleness. Johann’s calm energy and sensitivity to suppleness in his horses is proving to be the key in polishing and preparing horses like Verdi to the Grand Prix ring. Dressageclinic.com is proud to present this deeply educational and informative video with Sharon McCusker, from Ashby MA USA, who brings us this riding and lecturing session displaying the progress with her exceptionally talented Wrigley – a 9 year-old gelding training grand prix at the time of this video. Sharon explains in detail everything she is doing and thinking while riding. Wrigley is now competing successfully at Grand Prix and we were fortunate enough to have recorded portions of the training process of this talented horse and rider..
Wrigley and Sharon McCusker are considered one of the top horse and rider combinations in the international Grand Prix ring. This video is an example of a successful Grand Prix horse today and the training Sharon gave him in the recent past to get her horse to where he is today. A must see video for every serious dressage rider who is interested in the finer points of dressage training. The investment is time in the training ring using clear, honest and fair and consistent aids. Sharon is cautious of her approach of Wrigley, as she want to gain and maintain elasticity in her horses.. Sharon wants strong but loose muscles in Wrigley and is always making sure she is working him in a relaxed, elastic, yet displaying positive upbeat energy. Sharon comments that Wrigley has changed from last year’s video and he’s now more balanced, has more elasticity, greater ground cover, and is lighter off the ground. And Sharon shows his progress in today’s video compared to older videos of Wrigley on DressageClinic.com. Sharon ensures he is, "with her" on half halts, on both reins, and has the uphill balance that produces quality gaits and superior movements. In this video Sharon works Wrigley on a few elements required of grand prix horses including canter half pass and tempis as well as piaffe and passage. The trot was the last thing to come together’, she states. Sharon is an excellent rider to watch as she can share her decision-making and aid use while working Wridley. Her fairness in training shines though as she comments on how late cues by the rider are not the fault of the horse and rewards Wrigley for good, honest hard work and when quality gaits are achieved. The proof is Wridley happily providing solid piaffe and passage movements. Shar on reminds us that the best way to instill upper level movements in our horses is by delivering clear aids and rewarding them when they have done it right. Something many riders forget to do. Congratulations Sharon and Wrigley and thank you for this riding and lecturing video for all dressage riders and trainers to share. Pam Goodrich Instructs How to Develop Balance, Relaxation, and Obedience with 5-Year-Old Lucienne, a Danish Warmblood Mare. Dressageclinic.com is pleased to present Pam Goodrich assisting Sarah Jane Arthur aboard 5-year-old Lucienne, a Danish warmblood mare schooling Training Level. Watch Pam Goodrich assisting Sarah Jane Arthur on the 5-year-old Lucienne, a Danish Warmblood Mare Schooling Training Level. Pam shares her philosophy of schooling the 5-year-old horse under saddle. Pam likens the young horse to a child entering kindergarten. ‘’They have to play in certain confines,” she explains. “I liken it to crayons and a colouring book, they can’t write on the desk.” She expects the horse to begin respecting the work by not having temper tantrums and beginning simple work that exercises the large muscle groups. Pam instructs Sarah Jane to keep the horse moving in large sweeping circles and stay out of the corners to ensure the horse is continually working and not getting ‘stuck’. Pam also shares her main training goals for the young horse. First, the horse must know the basic aids of walk, trot, and canter and be responsive and forward to the aids. The young horse must also accept the bit. From there, the young horse begins to learn to balance within these gaits and trust the rider to gently guide them back into balance. “If they are ‘out of control’ in their bodies, that is okay. You guide them back,” says Pam. Pam coaches Sarah Jane in completing many simple transitions to keep the forward movement in the horse light and responsive. They practice serpentines, leg yields, and finish with a horse showing more suppleness in her topline, suspension in her gaits, and better balance in her body. This video is a valuable lecture on developing balance, relaxation, and obedience in a willing 5-year-old. Well done! DressageClinic.com is proud to present to its membership, the complete Exclusive online coverage of the 2017 CDS 50th Anniversary Symposium held at the Mel Mar Fairgrounds in Del Mar CA featuring Christine Traurig, Hilda Gurney, Steffen Peters and Charlotte Bredahl working with selected demonstration riders and horses. The format was super interesting and educational..
Christine Traurig was amazing with her precision explainations and mico details she was constantly bringing to the attention of the audience. 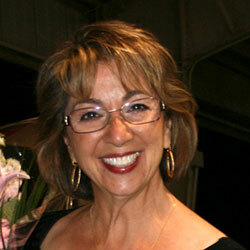 Christine Traurig is noted as one of the world's most knowledable and capable dressage trainers. Charlotte Bredahl had two talented Young Riders and demonstrated their progress towards the Grand Prix competition. Christine worked with two of some of the best young four-year-old horses in the country, explaining to the audience and the talented riders the steps and techniques needed to continue the training towards a competitive FEI arena. Next Hilda Gurney did a very informative demonstration using trained horses to show each step through the levels—from free walk to walk pirouettes. She followed each level having the demo riders show how the level of collection changes and the new movements that get added along the way. The levels—from free walk to walk pirouettes. She followed each level having the demo riders show how the level of collection changes and the new movements that get added along the way. It provided a clear picture of what happens through the training process to work up to the FEI levels. Next, Steffen Peters brought out Dawn riding Legolas to show how a talented younger rider can step into the competition ring on an experienced (and amazing) horse to learn how to be competitive at the top levels of showing. Lastly, Steffen brought out his new FEI horse Rosamunde to explain how he is bringing her along towards her peak performance in Grand Prix. Steffen talked a lot about the challenges of training a very hot horse like these two (especially Legolas) and that the operative word required was patience. A fun part of the day for all was Steffen bringing out the cookie jar for Legolas at the end of his ride. Legolas even knows how to open the lid and does this daily at the end of his work. An amazing Symposium, with deep dressage knowledge and images of amazing horses and riders. 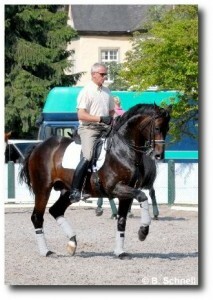 DressageClinic.com is your educational partner for the best dressage education anywhere in the world. Don't waste your money on websites with big promises and nothing to show for it. Become a member to DressageClinic.com and watch the top international riders working with their horses in training. Dressageclinic.com is pleased to present a Classic Training Session featuring Elizabeth Ball, riding and lecturing aboard Unitario, a 12 year-old Lusitano Gelding training Intermedaire 1-1, 1-2 and Pre. St. George. 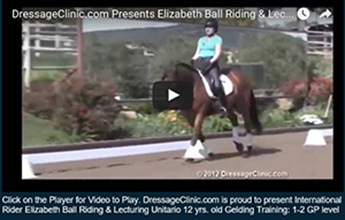 Watch Elizabeth Ball riding and lecturing aboard Unitario, a 12 year-old Lusitano gelding training Intermediare 1-1, 1-2 and Pre. St. George. 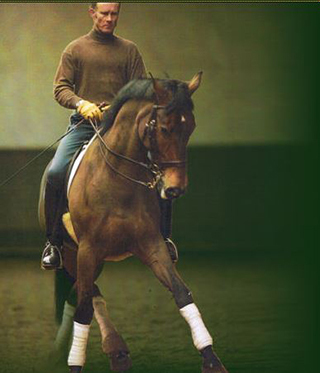 This classic training video is a beautiful lecture and demonstration showing how this 15.3 hand average gaited horse, through Elizabeth’s philosophy and technique, can produce suspension, engagement and lightness in Unitario’s trot, passage, piaffe, and flying changes. Imported from Brazil, Unitario is owned by Julie Bullen at the time of this video. To demonstrate, Elizabeth asks Unitario to transform his flat trot though half halts into a suspended trot. Then by reducing the speed and increasing the activity – passage and half steps emerge. By going forward, we see a lengthening trot. All these variations of balance and speed create variation in the gaits. Elizabeth visualizes her horse moving forward in front of her low heels. Elizabeth shares the importance of keeping a deep, supple seat. This is another way of saying the horse is in front of your seat. She reminds us to stretch into your stirrups while keeping your deep seat as it becomes very important in collection work. “Corrections shouldn’t become maintenance,” she affirms. “If you have to hold them together and squeeze them together, once you’ve half halted, can you release and hold it on your back on your soft seat and neutral hand? Or are you dependent on holding him up?” We should be providing only a moment of correction aids she explains. In essence the horse should do his job and carry himself. This leads into the final point: Trust. Congratulations to Elizabeth for her clear and beautiful way of sharing her classical principles of dressage. Dressageclinic.com is proud to present Bill Warren, assisting Courtney Fanara aboard her horse Brighella, a 13 year old Hanoverian gelding training Pre St. George. Watch Bill Warren assist Courtney Fanara aboard her horse Brighella, a 13 year old Hanovarian training Pre. St. George/Intermediare I.
Courtney has a wonderful seven year relationship with her horse and Bill, a USDF medalist and one of the top dressage trainers in North America, brings creative and playful exercises to this lesson to ensure the horse and rider are both loose and happy in their progression. In this training video, Bill focuses on developing the pirouette and uses the cavaletti to develop the working pirouette which keeps it fun for the horse and for the rider as well. Bill, a USDF medalist and operator of Warren-McMulin Dressage, introduces the horse and rider team. Courtney has a wonderful 7 year relationship with her horse which is supported with Bill’s creative and fun coaching exercises. They begin in a long loose trot over the cavaletti and embark on suppling exercises to stretch not only the horse, but Bill emphasizes this is also important for stretching out the rider’s shoulders, back and neck as well. Canter depart is confirmed which is practiced with imperceptible aids which bill shares that, it is also a good indication of how flying changes will be performed. Bill is also an expert of detecting tension in the horse and rider and coaches the process of relaxation into the lesson. “Think about your own relaxation. No pressure on the horse. Riding does not mean wrestling.” He often encourages less use of the spur and less resistance in the hands to a bracing neck. This not being ridden correctly, often increases the tension in the horse. 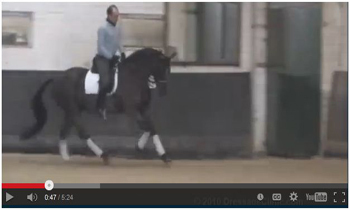 Shoulder-fore into Renver is perfected in the trot then halt-trot transitions are confirmed and refined. These are valuable points for every rider to grasp from reality training video.. Following begins the use of the cavaletti to encourage a forward canter after collected canter is achieved. The horse rides into the corner, performs a working pirouette, then rides forward and playfully bounds over two cavelettis placed in the centre of the arena. The horse then rides to the opposite corner and collects again performing second working pirouette. Success! As a reward, they stretch into a beautiful medium canter down the long side then collect again performing the exercise a second time. Dressageclinic.com is pleased to present Jan Brons, riding and lecturing aboard Zonneglans a KWPN 9 year old gelding by Ruben Royal training Pre St. George/Intermediare I. Watch Jan Brons riding and lecturing aboard Zonneglans a KWPN 9 year-old gelding by Ruben Royal training Pre St. George/Intermediare I.
Jan is a well-respected FEI trainer who operates Jan Brons Dressage out of Wellington, Florida. He has won many USDF medals, ridden many horses to National Championship titles and is a demanded teacher and clinician. Jan has his work cut out for him with this beautiful, strong-minded gelding. His introduction of the horse includes stories of his wild and sometimes rude behaviour that often resulted in him being sent to ‘detention’ where he worked out his frustration in the lunging ring against side reins until he’s ready to come out and be ridden again. Jan has his work cut out for him with this talented, dominant horse. His focus: developing ridability in Zonneglans. This video would be of tremendous value to those that have a horse that often pulls heavily on the hands and forces their agenda on the rider. Jan, a confident and rock solid rider, never lets Zonneglans over rule his requests and spends much of the ride reinforcing his invitation for the horse to ‘wait for him’. This video takes you into a regular training day with Jan Brons who ensures that Zonneglans is given clear instruction and then is corrected if the activity is now what was asked for. Zonneglans comes with an unflappability as he remains calm with the sound of planes flying overhead, which Jan values. However, this horse also comes with a tremendous power which he constantly brings to each stride. Jan’s job is to remind Zonneglans that what is asked for: smaller, relaxed, willing movement. Jan frequently places walk breaks into the one hour ride to ensure Zonneglans is relaxed and ready for each stage of work. Canter begins collected as the horse wants to rider bigger, changes are repeated to ensure the horse doesn’t lunge into the new canter stride, and trot is often halted as passage naturally comes forth from this athletic horse. As mentioned, Jan wants to develop a willing, ridable horse that says with the rider, doesn’t anticipate movements, and responds to the aids of the rider in a soft way. “I don’t know how long that’s going to take”, comments Jan. In this video, we see the use of clear correction with calm determination. Jan’s confident repetition of requests begins to soften Zonneglans as the horse gives to the bridle and the leg with less resistance. Jan is perfect for the job. It’s his calm, determined manner that lets this dominant horse know who is boss and what is requested of him. Good luck Jan with this powerful horse. Dressageclinic.com is pleased to present this video of Anne Gribbons, assisting Karen Lipp, the owner and rider of this 9 year old Dutch mare named Baxamiliana training Grand Prix. Watch Anne Gribbons assist Karen Lipp on her 9 year-old Dutch Mare training Grand Prix. Anne’s coaching for Karen and her honest, willing mare focuses on the canter work for Grand Prix movements. Not surprisingly, Anne offers Karen three clear learning tips with exercises to strengthen Baxamiliana. Anne coaches on the importance of balance, the use of piaffe and the value of staying quiet and out of the horse’s way. This is an ideal video for those that have that talented, willing horse that is ready and willing to find their own balance in the turn and get stronger in self-carriage while performing upper level movements. Anne enforces the requirement of balance in this video. Exercises like changes on the circle and in serpentines gives the horse the opportunity to practice finding her own way of keeping in balance. “Horses hate to fall”, says Anne. And with a balanced horse in the turns, we have a horse that can keep their own tempo which is ultimately what the judges want to see in the ring. Finally, Anne coaches Karen to find quietness in her riding. “You’re too entirely engaged in the change”, coaches Anne. “She can’t wait for you to get out of her way.” Anne shares that Karen is riding the horse too much and interfering with the horse’s job of balancing and finding her self-carriage in the work. Anne then continues to coach Karen to ‘sit heavy', 'sit back', 'sit quietly’ with beautiful results. The horse naturally does the work of balancing herself. 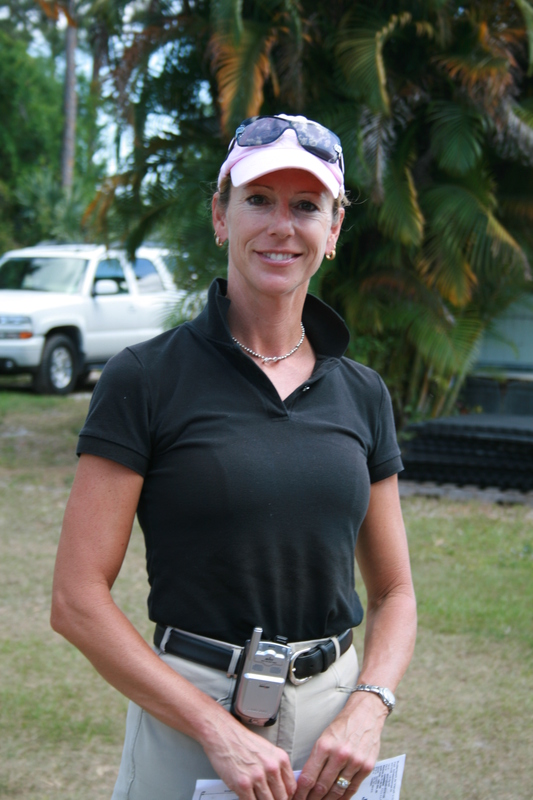 Anne’s resume is heavy with experience as a FEI 5 judge and competition success with over 16 horses trained to Grand Prix under her seat and many more under her leadership. She’s competed extensively in Europe and was a member of the U.S Silver medal team at the 1995 Pan American Games in Argentina. 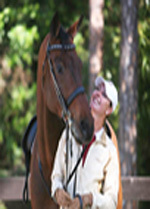 Anne and her husband own and operate Knoll Dressage in Orlando Florida. 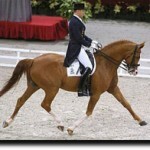 Available at DressageExtensions.com The Global Dressage Forum NA has released a Limited Edition of a 5 DVD set. The GDFNA is North America’s leading educational platform for the international dressage world. Twenty-Two of the World's Top International dressage trainers and educators had gathered together in Florida to present…Arena Demonstrations, Face to Face Interviews and Panel Discussions with Moderator and Founder Andreas Stano as the visionary leader. Stephen Clarke, Jan Brink, Conrad Schumacher, Tinne Vilhelmson, Bo Jena, Christoph Hess, Christilot Boylen, Udo Lange, Charlotte Bredahl, Volker Brommann, Kathy Connelly, Pam Goodrich, Anne Gribbons, Arthur Kottas, Leslie Reid, Mette Rosencrantz, Betsy Steiner, George Williams, Suzanne von Dietz, Terry Gallo, Sue Leffler, Jochen Schleese were the presenters on stage for the unforgetable two days of dressage education. The Global Dressage Forum NA gathered 22 of the world's most successful Dressage Trainers and presented a two day forum on the Training and Development of Dressage Horses and Riders. It was the most successfull dressage production ever produced and a memory that will remain in the mind's of the sold out audience for ever. Don't miss out on this limited edition sold through the official distributor DressageExentions.com Order now before inventory runs out. The perfect Christmas Gift, or the perfect gift to yourself as a serious and dedicated dressage rider. Order from DressageExtensions.com for immediate Delivery to your home. 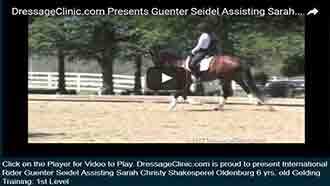 Dressageclinic.com is pleased to present this training video of Geunter Seidel, assisting Sarah Christy riding Shakesperel, a 6 year-old Oldenburg gelding back in training after a year in the pasture..
With less than two months of riding underway, Guenter guides Sarah in schooling Shakesperel into 1st level frame and tempo. Watch Geunter Seidel Assisting Sarah Christy Riding Shakesperel a 6 year-old Oldenburg – Click on the Player. Guenter brings a wealth of knowledge to the ring delivering coaching tips with clear, simple instruction complete with detailed observations.. Since immigrating to the U.S. in 1985, he’s consistently raised the quality of dressage riding all over North America.. His kind, rewarding feedback and clean riding style have many seeking his coaching guidance. 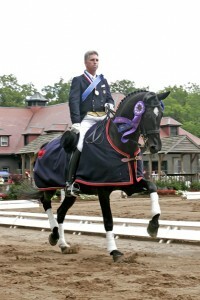 Geunter Seidel is considered as one of the best and most knowledgable dressage trainers in the world and DressageClinic.com is proud to present him to the membership. Here are Guenter’s top 3 tips he shares with Sarah for training young horses returning to 1st level work. Guenter wants to see specific qualities in a horse as they warm up. He wants to see a horse that is rhythmical, loose, relaxed, in good frame with self-carriage. Sarah hits the mark. “I like the way this horse is going,” he says. “That is a good way to start and have him warm up.” Through out the video Guenter points out very important aspects for developing dressage horses. The majority of the work in the video focuses on bringing Shakesperel into a more carrying and uphill presence. Guenter warns to keep the hands low and to keep the rein length shorter to connect from the hind end.to the front. Each minute of the lesson has the horse gradually accepting more positive contact and making stronger steps resulting in Sarah being carried by the horse – and bringing about more powerful steps. “Let him carry you not run though you, “ reminds Guenter. Guenter explains in the video he is extremely conscious of the fitness and strength of this horse, which is just coming back into training. He reminds Sarah to take a walk break if she feels Shakesperel tiring and encourages short riding periods as he returns to work after a year in pasture. He’s aware of the strength that is required of Shakesperel, the current status of his conditioning, and constantly guards against overwork. This video is vital for understanding the process of bringing back horses from a long rest and most informative as it shows us what is important when working with our youngerters. Guenter sees great potential in this young horse and Sarah performs well to bring it out. Great work. This is a very important training video to study and watch over and over again. It is a foundation resource for every dedicated dressage rider. 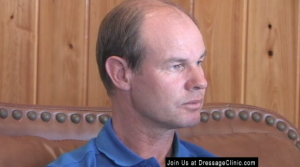 Dressageclinic.com is pleased to present this video of Stephen Clarke, a tremendous coach who is extremely sought after in the dressage world. Currently, Stephen holds the position of most senior dressage judge in the world. He is known as a fair evaluator with balanced and consistent assessments, which has earned him the esteemed Judge General role. He continues to enjoy departing his wisdom to numerous top riders in the industry. Today’s lesson is focused on gaining immediate reactions from our young horses using light aids. Judith Sloans on 4 year-old Rusty. Judith, a competent and dedicated rider, is blessed with training this honest 14 year-old Hanoverian named Rusty who offers his whole heart to the work. Stephen, who has coached Judith earlier, is clear with his work for Judith today: the priority is to ‘be deadly consistent’ in remaining still in the body and having the horse react to a light aid. He reminds Judith to be still and ‘sit like a church mouse’ and let him react and do the work. “What you need to think,” he says, “is you need to train him so a little old lady could ride him.” He wants the horse feather-light to the aids. Stephen reinforces this by his observation of the para-riders who have little bodily strength yet have horses that instantly respond to their light, subtle cues. Stephen looks for the horse to respond with a change of energy within the gait and not race forward thereby losing his balance and rhythm. Moving in between trot and canter work, Stephen requests slight modifications of Judith: to work light on his back by riding in rising trot so not to push the horse with the seat. This allows Judith to remain focused on the priority: having Rusty react to light aids. They end with practicing turning on the forehand and having him rewarded for his first reaction. “Make a game of it,” says Stephen. Stephen comments to the owner from the sidelines: “he’s lucky he’s with you two because a lot of people would take advantage of this horse.” He recognizes the beautiful temperament of Rusty and reminds us to take our time as many ask for too much too soon from these young, big-hearted horses. It is a pleasure to have a piece of Stephen’s precious time. His warm and sunny demeanour fills the lesson with lightness and diffuses any difficult messages with a warm comment and clear instruction on how to improve the progress of horse and rider. Stephen’s kind spirit is a pleasure to witness and we look forward to watching him continue to mentor a vast assembly of riders and their horses straight to the top. Dressageclinic.com is proud to present this classic video of Juan Matute, riding and lecturing aboard one of his most successful horses, Wie Atlantico, a 7 year-old Hanovarian training Prix St. George. A highly sought after dressage coach based in Florida, Juan has had years of experience and known as one of the most talented dressage trainers in the world. Juan has represented the Spanish dressage team in Barcelona, Seoul, and Atlanta Olympic Games amoung his many accomplishments. 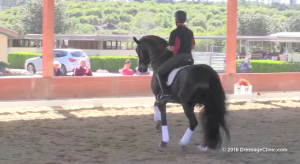 This Classic video displays a patient graceful warm-up, continueing and being focused towards training of a talented, forward horse, developing the canter, the pirouette and tempi changes with some light passage and piaffe steps. Juan is lecturing as he is riding and does an incredible job speaking clearly and thoughfully throughout the ride. Watch Juan Matute aboard the 7 year-old Hanoverian Gelding Wie Atlantico, Training Prix St. George. Juan begins with a warm-up that has Atlantico happily working first around the outside of the ring then inside the ring in an easy, light and forward manner. Juan explains that he wants the warm-up fun for the horse and warms up Atlantico light on his back in a two-point seat with little demand. “He can express his power, right from the beginning,” says Juan as he allows Atlantico to show his proud personality. Juan is not worried about head and neck position or frame at this point and, instead, wants his horse free in his movement during the the warm-up. Juan’s challenge is to work on pirouettes and shows his techniques for ensuring Atlantico is on his aids before pirouette development where he rides a square; collecting in the corners then powering forward developing quarter pirouette turns. He explains in details how de does this. To compliment the pirouette training, Juan rides Atlantico in haunches-in developing the powerful, rhythmic collected canter needed for pirouettes. Canter changes are tested followed by a medium canter then collected canter before walking. Finally, Juan develops the passage with a touch of light piaffe work showcasing Atlantico’s power which Juan easily coaches into balance. Juan has formed a superior partnership with Atlantico and this Classic video demonstrates the value of developing a happy horse – which leads to a productive and pleasant training experience in the ring. This is a very important video for every dressage rider, trainer or enthusiast to watch over and over again until certain phrases and moments are memorized. You must watch this video. Dressageclinic.com is pleased to present this video of J.J. Tate, assisting her assistant trainer Kaitlin Blythe aboard Eden, a 6 year-old mare acquired by Kaitlin a year prior to the filming of this video. This video is loaded with great teachings which J.J. has received from her long experience of training horses. Grab your notebook because J.J. Tate has a packed lesson full of valuable knowledge on the fundamentals of their program that consistently develop strong, supple, and engaged horses. “I never want the horses to feel I’m rushing through their program,” says Tate. She shares that with horses, especially energetic horses, it is always important to let them know that you are never in a rush to get them ready. She explains that when the horse feels they have the time to walk in the warm up, the horses’ emotional outlook on life and their spiritual wellbeing never suffers. J.J. shares the teachings she credits receiving from her mentor and dressage legend Charles de Kunffy where we want to be able adjust three major ‘dials’ or aspects of the horse’s movement. The first dial is frame length of the horse, which allows the horse’s length very long to very short or in show frame. Second ‘dial’ is is stride length that allows the horse to have the range of performing a piaffe or pirouette canter to an extended trot or extended canter. Finally, the third dial is bend or straightness of the horse. All three dials must be adjustable to achieve all movements in dressage. “We sit on the weakest place of the horse’s body and we hold on to the most sensitive part,” Tate jokes. However, the statement communicates the importance of ensuring the pelvis – the bridge to the hind legs – is accessible, moving freely and is strong. In this video, J.J provides training exercises that ensure the horses’ pelvis is rolled under and oscillating laterally. Seeing the tail swing and hips drop down from side-to-side with each trot step shows the pelvis is being activated and developed properly. J.J. Tate shares her techniques for getting the horse to ‘squat’ with the goal is getting the horses’ tail closer to the ground or engaging their limbs like a spring. She demonstrates exercises to strengthen and coil the horse's spring, which allows for more power and expression in movement. J.J. Tate also shares that we must be defined in and committed to what you want to teach the horse. “Whoever is in this in the saddle is who is training the horse,” Tate reminds us. She encourages us to be aware of our actions, to develop good habits, and be disciplined in our training with these incredibly smart animals. Great work is shown here through Kaitlin Blythe’s riding of Eden with J.J. Tate’s wealth of knowledge. J.J. Tate frequently credits her teachers for sharing their wisdom with her and it is a gift that she is committed to passing this knowledge on. Dressageclinic.com is proud to present this training video with Betsy Steiner, the international rider of top dressage horses including Unanimous and Rainer who has extensive International training experience with numerous top dressage luminaries such as Uwe Steiner, Herbert Rehbein, Kathy Connelly, Guenter Seidel, and Klaus Balkenhol. It is a pleasure to see her teaching with her long time student Wendy Limerick from Atlanta on her horse Danos. Danos, at the time of this filming, was a 16 year-old gelding who had lovingly been ridden back into form and completing 2nd level movements in a double bridle. This training video is for the rider that has the welfare and care top of as a priority for their aging dressage horse. If you are looking for the routine that gently invites flexibility and thoroughness and politely builds energy and forward movement with your mature horse, this is it. Click to Watch Betsy Steiner assist Wendy Limerick on her 16 year-old Gelding at 2nd Level. Foremost, Betsy Steiner has a kind way of interacting with her student Wendy. One gets this impression though her quiet easy coaching. Betsy is full of positive feedback balanced with clear instructions to breathe into the core, use abdominal muscles, and offer the rein. By linking these actions of the body together, Wendy gets Danos to become more ‘through’. Betsy reminds Wendy to open up her shoulders, take take a good breathe in then exhale and work though your abs. Here Betsy explains how the lower abs push forward in the lower body while the upper abs hold your posture and position. Danos begins to come up into the contact. As they work though trot and canter work, Betsy coaches to ensure the frame is never compromised when they gently ask Danos for more forward energy. Betsy reminds Wendy for flexion and release on the serpentine and ensures she keeps her connection on the outside rein. Finally, when Danos is though and becoming more forward, Betsy shares how to increase the energy in Danos with her excellent description of asking for energy from the seat and capturing it in the bridle. This is essentially the beginning work of collection and is well described in the later part of the video. Betsy recognizes each horse is unique and compliments Wendy for her decisions in managing Danos’ fitness and health. Excellent work to both Betsy and Wendy. 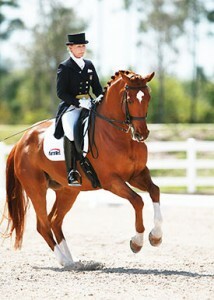 Dressageclinic.com is proud to present Heather Blitz one of North America's most talented dressage trainers. We have the opportunity of seeing Heather in the training video of her Riding & Lecturing on Rip Line, a 4 year old Danish Warmblood stallion. At the beginning of the session, Heather begins with explaining Rip Line’s favorable temperament, confirmation, and three super gaits. “He’s an exciting young horse for me”. Heather confesses during the ride. This young natural athlete shows willingness, energy, and confidence. He flows around the outdoor arena with a sense of natural balance as a 4 year old. This is truly a valuable training video for those interested in riding young horses or interested in understanding the procedure for riding young horses, especially stallions. Heather provides great feedback and brings fourth important training comments on Rip Line’s acceptance of the bit, submission, and suppleness. His ridability is easy and simple, she explains as she analyzes further in details. A natural rhythm is apparent in this uncomplicated 4 year-old stallion. She explains that it is very important for stallions to be accepting of situations at this age where they can keep their focus on the work instead of looking around expressing more interest in their surroundings rather than what is going on on their back and in their mouths in relation to the bit..
And she does excellent work with Rip Line. This video exemplifies the easy way we can ride our horses – in a simple, relaxed way to develop their confidence and bring out their natural movement. Sometimes simple is best and less is more. Heather takes us through her routine of keeping contact and flowing and reaching in the walk. Heather focuses time on the walk as she feels the rest of the training improves if there is great connection in this gait. The right amount of power and tempo in his legs gets the reach in the walk Heather likes to feel. Heather also begins showing her halt exercises. She reminds us to keep our horses straight – not anticipating a turn. She also has Rip Line find his balance at the halt and asks him to wait for the next cue from his rider before moving on. All great methods of preventing your horse to anticipate the next activity. by the end of the session, Heather rewards Rip Line with a long and low rising trot showing his balance and confidence before continueing more trot, canter, and the beginnings counter canter work. Heather has a great horse and keeps him happy with three to four days of work mixed with lots of rest, treadmill work, and hacks as he’s still young and still growing. What an amazing opportunity to work with such a confident, levelheaded athlete. Rip Line is in good hands. Well done Heather. Dressageclinic.com is pleased to present Swedish FEI Judge and coach Bo Jena assisting Bianca Berktold aboard Kanendo, a 10 year-old gelding training at the Grand Prix Level. This particular video is extremely informative as it demonstrates how only a few well-timed words are needed when a solid relationship is established between trainer, rider, and horse. Most importantly, this video offers a solid routine for capable riders to use to practice and perfect upper level movements with their horses. The exercise routine shown in this video is efficient, effective and gets great results. Bo and Bianca work together to train Kanendo among the sounds of early morning birds and a sunrise in the distance. The outdoor setting is calm and peaceful. It is clear that besides the tranquil setting, that Bo and Bianca are peaceful too. Bo gives calm quiet instruction to Bianca and she responds with Kanendo warming up at a deep rising trot then canter ensuring correct flexion and shoulder position of the horse. Following the warm-up, the training begins with Bo quietly viewing each executed movement and replying with necessary feedback to confirm the movement was up to standard. Often, he’s say ‘fine’, ‘good boy’, or ‘pet him’ to show his approval. Bo’s calm words and simple feedback make for a peaceful but effective and deeply thought out training session. Bianca responds quickly to Bo’s requests for pats or walk break rewards so that the reward is felt and understood by the horse. For Bo, the delivery and timing of the reward is vital. The 32 minute video is full of various exercises and movements completed in smooth succession with shoulder in, travers, halfpass, working pirouettes, tempis work, passage and piaffe steps all occurring in the latter 20 minutes of the training. Bo and Bianca are extremely efficient and organized, achieving their training goals quickly before Kanendo tires. This video is excellent at exposing what Bo is looking for in each movement. He can discern a good halfpass from an excellent one or coach Bianca to reward Kanendo at the tempi change where the horse worked particularly hard to achieve a good result. The timing of the reward is everything. This discernment Bo communicates in the video is visible and tangible and shows us the importance of precise timing when rewarding our horses. It is a pleasure to watch this productive training session quietly unfold. With Bo Jena’s lovely coaching and Bianca’s skill, superior gaits and quality movements are realized with Kanendo. Well done. 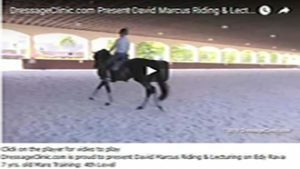 We have a unique opportunity here to watch and listen to David Marcus while he is riding and lecturing on a 7 yrs, old mare training at 4th level. This video demonstrates David’s calm, unflappable form while riding this sensitive and nervous mare with amazing potential – under the right leadership. David clearly displayis that not only has the right leadership as a dressage trainer but also tact and finesse to get along with a mare that needs to be ridden diplomatically. This training video illustrates how great refined riding from a rider can dramatically influence a horse's way of going. David’s leadership and guidance is exactly what this mare needs. It is supportive, has good judgment and there is a gentle, unwavering determination to ensure the mare can always trust him. We all know how more difficult it is to ride a mare verses a gelding, so for all of you who either ride mares or want to become more experience riding mares, this is the video to watch. The video is set in a spectacular white sand, open-walled arena where this sensitive mare frequently notices the cameraman and audience. This brings David’s lecturing to the surface as he explains his priority to release tension and inspire confidence in a mare. Many times, it could have gone another way, but David’s style results in a beautiful 40-minute training session where they accomplish clean changes, beautiful half-passes and, at the end, a relaxed horse walking towards the camera looking almost pleased with herself. The details that David expresses while riding are to the point and precise. Like every trining session, it has errors. David downplays them beautifully, which is perfect for this horse. David’s success in the dressage ring shows in this video. As he rides, he explains his use of aids to achieve balance, connection, and relaxation, which, he states, are required before we ask any questions of a horse. In this video, David takes some time at minute 20 to explain the importance of horses trusting their riders. From his experience, he believes we should always ride to confirm that our horse always trusts us. This is how partnership forms between rider and flight animal shares David. He jokes saying this mare is constantly asking him ‘What do you think David, am I okay?’ He explains that by keeping his connection with seat, leg, and rein plus the use of his voice, he can keep her confident and feeling ‘okay’ with the situation. With a horses’ trust, we can achieve great things. If you watch this video several times for study, you’ll notice David constantly talks to the mare, almost like a travelling partner on a journey. David’s dialogue is reassuring and you can see the mare knows David is on her side. David also brings great decision making to the mare’s training as he modifies the length of the ride to accommodate a longer warm-up. He shortens the duration of the gymnastic portion of the training to prevent fatigue and regularly modifies the session with exercises to reduce any tension that arises in the mare. He listens to the horse’s breathing and observes her ears. He never misses a signal from this lovely mare. As a result of David's attention and guidance, the mare produces super work. In the end, David ends the training right after receiving a lovely canter change. Both David and the horse are relaxed and look pleased – success! Hats off to David in this video. He shows us what great leadership can accomplish. If you are a serious, dedicated dressage rider who wants to have a better understanding riding mares or sensitive horses, this is the video to watch. We welcome you to the world of DressageClinic.com, your membership is very important to us. Dressageclinic.com is pleased to present clinician Karen Pavicic assisting Rebecca Cowden, a willing rider with her forward 6 year old Oldenburg named Fancy Fay. DressageClinic.com is proud to present one of the world's top international dressage trainers enjoying an highly successful career in the international ring. The reason we were so excited to present Karen Pavicic is because we noticed that Karen has an intense focus and sophistication when she helps one of her students or is riding and lecturing herelf. This video of a 6 year old is highly beneficial to the developement of young horses, a must see video training session for all serious dressage riders. From the begining of this video, Karen works prescriptively with Rebecca to bring her horse in front of the motion and into a correct bend as she explains. Many of us are working with these young, bright, and enthusiastic horses, but what is important is that we are ensuring they move in a way on a circle that keeps their shoulder from escaping to the outside and building a natural curve and bend in their bodies around our inside leg. So important for all riders to understand. If you are serious about your development as a dressage rider, either professional or amateure, this video is for you. The information Karen shares with us as to how to get a correct bend and also straightness in your horses. A tricky but necessary combination. This video is also very valuable for the rider who is beginning to understand outside rein to inside leg or has captured the idea but wants to define it even further. Karen also reminds us of our hand position and to keep both reins on either side of the withers. We often ourselves, move our hands all over the place to ‘correct our horse’s bend’ and Karen’s coaching brings us back to correctly positioning our hands and implementing the correct contact through our aids in order to guide our horse into a desirable bend. 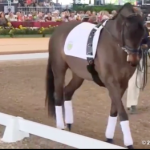 As far as circles are concerned, Karen throughout the video reminds us that timing and preparation of the aids in the circle is the overall message for a young horse to appreciate. Karen has a way of signalling to the rider the moment where we politely respond to our young horses. Rebecca does this well and moves her horse into the correct bend over the course of the lesson. It often it takes experienced ‘eyes on the ground’ to help us see the details of the particular points of what our young horses need guidance in their development. Karen’s has that skill of reading what the horse needs and can convey precisely timed actions for the rider. The result is great progress. The lesson comes at a great time for Rebecca as we notice improvements in the 26-minute lesson with the pair. Rebecca’s Fancy Fey is a lovely horse that is tremendously coachable and honest. Karen has that spirit in her coaching that lights us up when we get it right. Rebecca takes both and brings it all together wonderfully. Enjoy. Dressageclinic.com is pleased to present guest clinician Rein van der Schaft coaching two riders and their horses: Grace Goodby with her chestnut 18 year old Hanoverian Gelding and Callie O-Connell riding a 5 year old dark bay Oldenburg gelding named Ferry. Rein begins this training sessions with a valuable lecture in which he shares his training philosophy for the development of dressage horses.. Rein explains that one of the goalsl of dressage is “that the horse divides his weight and the weight of the rider overtop of him, as much as possible over his four legs equally.” He then adds that this must be done “without having the horse tense”. The horse must be forward and be relaxed. “When we drive them forward, there must be an immediate reaction going forward,” says Rein. “You touch him, he must react.” This is called obediant impulsion. Rein shares that in his horses, an immediate response to his driving aids must be there and it must be immediate. 2) Next, you need contact with the mouth of the horse. In the forward riding, there must be contact with the mouth. Rein explains… "To begin with, follow the horse’s mouth in the walk first; keep the contact as much as possible the equal on both sides of the mouth. Once the horse trusts the hand of the rider – equally on two reins, the horse will begin to relax". Rein shares that the hand must be first accepted by the horse. The horse must be forward into the bridle and connected to your hand from his hind leg and can now begin to be asked to shift his balance more to the hind end. Rein warns that this cannot be done before the horse accepts your hand. “If you do this before he ‘accepts’ your hand, then it becomes like pulling, and this is not what we want in training our horses. Rein then shares that once the two criteria above are met, the rider can now ask the horse to shorten and shift his weight and let the hind legs come under so the fore legs come more free. Rein’s clear and concise 10 minutes of theory is necessary content for the dressage rider and trainer. Rein continues with showing these concepts in action when two capable demonstration riders and their mounts enter the arena. Both horses have varied experience and education, which is helpful for viewers to see how Rein coaches each horse and rider team under his philosophy of having the horse relaxed and forward and connected in the hand. Rein rewards his riders often as they implement his requests of riding forward, evenly in both hands, and managing the contact to bring collection. What a special opportunity to have Rein’s classical dressage understanding captured on video with two lovely horse-rider combinations. Rien van der Schaft is considered one of the foremost clinians in the world. It is a previlge to listen and beome part of his lesson. Enjoy! DressageClinic.com brings you the expertise of celebrated Clinician George Williams who's classical understanding of dressage is being benefited by all viewers in this video training session with Jessica Stark and Ultra Sonic riding her 11 year old mare. Click Above to Watch Sample Video of George Williams coaching Jessica Stark on Ultra Sonic, an 11 year Old Holsteiner Mare Schooling Grand Prix. George Williams just has a beautiful way of communicating his training vision for dressage horses. Their development requires attention to the subtle aspects of effective ridinge: maintaining suppleness, rhythm, and thoroughness in all movements performed. 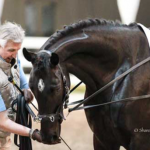 George's wisdom has been tested with proven success on the International stage and his approach for the training of dressage horses originate drectly from the training scale. He refers to the training scale at minute 26 and shares his thoughts to Jessica Stark, the quiet, competent rider on the 11 year old Holsteiner mare Ultra Sonic while schooling grand prix movements. George states in the video that rhythm and relaxation support throughness and throughness is needed for all other positive results. It is coaxing softness and suppleness in all aspects of the ride that brings a good horse to a great horse and brings a talented horse into a champion. This horse and rider combination is being guided step by step to supple the body and be fluid while keeping energetic forward tempo. George Williams does it effortlessly; communicating with informative teaching, detailed instructions coaching the rider and guiding their progress. This strong riding pair and George’s coaching style rewards us with the true mechanics of dressage and what we must focus on to bring the best out of any dressage horse and rider combination. Any serious rider would be so lucky to be under George's kind and clear tutelage. And if we are not, then we are blessed to have this video to bring us one step closer to the understand of relaxing our horses, connecting and bending their bodies while maintaining an energetic forward tempo thereby constantly improving throughness. This lesson video reminds us to cherish these aspects and rewards us when we truly get to understand them. Finally, further into the session, we see Jessica and her mare working the canter where again, softness and suppleness becomes the mantra and basis of success for the pirouettes. In the last minutes of the video lesson, George shares that it is the subtle improvements like relaxation, suppleness, rhythm, and thoroughness that bring a talented horse like Ultrasonic to a magnificent contender at the highest level. Hats off to George Williams and his coaching of Jessica and Ultra Sonic. We had the pleasure of witnessing the use of subtle dressage tools we can all adopt to moving our horses closer to greatness. DressageClinic.com is proud to present, one of North America's most talented dressage trainers, Florida based Shannon Dueck riding Question, a talented Oldenburg 8 yrs. old Oldenburg gelding– or otherwise affectionately known as Johnny. This is one of the most effective and linformative training video we have yet to bring to you. 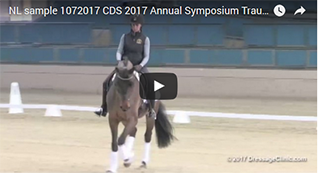 For the entire duration of this training video, Shannon rides Quaterback through a series of training exercises that are a sure path for strengthening and balancing towards the FEI levels. Currently, their work involves 3rd level strength-training movements including lateral work in the trot and canter, staying uphill when collecting at the canter, practicing clean and straight changes, and developing the beginning movements of canter pirouette. Additionally, Shannon reveals her philosophies around horses and their training during the 40-minute riding and lecturing video with Johnny. As she flows effortlessly around the ring, lengthening then collecting in the corners and often checking for correct movement in the mirror at the far end of her riding ring, Shannon is close to her words and can describe her views of what Johnny needs and what exercises he best benefits from to bring the best out of him. Her natural talent of communicating linked with her experiences riding in the US, Canada, and in Europe makes Shannon a knowledgeable and effective dressage educator. In addition, her time in the saddle training many young and experienced FEI level horses gives her an influential perspective on the individuality of each horse and, thereby, their individual training needs. Shannon easily reads the horse and effectively adapts exercises to best teach the horse how to move like a grand prix champion. This video is rich in riding philosophy and executing training details, which we can all reflect on and implement when riding our own horses. Shannon takes her time to warm up Johnny and connect with him. She usually takes 10 minutes or more to warm up her horses, which begins at a walk, and then moves into a trot that is low in the neck and has a steady tempo allowing the horse to balance and exhale. Shannon wants to feel the horse is “well connected, seeking the bit, relaxing and becoming supple to the point that the horse can point his nose to the ground.” This is the necessary feedback before beginning to all subsequent work Shannon explains while riding. Strength is the platform for all upper level movement – and it takes time to get it. Knowing your horse and his strengths and weaknesses are necessary for improvement. For Johnny, Shannon recognizes improving strength and confidence is needed for him. Before beginning, Shannon shares with us a bit of insight about Johnny. “He has a lot of strength building to do before he becomes a good FEI horse,” she states. She is also quick to share Johnny’s strengths too: “He’s a very supple horse, he is a very talented horse.” And as such, Shannon has a plan to work fairly towards improving his strength and confidence all the while maintaining and rewarding his natural gifts of suppleness and talent. As a trainer, Shannon shares the need for being flexible and adaptable in training your horse. Shannon shares how she used many exercises to find the right method of communicating the concept of changes to Johnny. Shannon’s positive feedback to the horse is lovely. She has a dialogue not only for her video audience, but also for Johnny as well. Her kind feedback to him includes words like ‘good boy!’, ‘good job!’ and ‘super nice!’ and rewarding activities like neck pats, walk breaks and stretching circles are scattered throughout the ride. You get a sense that Johnny’s work is fairly compensated and he is happy to push for excellence in the exercises. The feedback is clear, positive, and well-timed and is perhaps one of the most potent tools in Shannon’s riding tool box. This is special video that shows us a wonderful rider using a beautiful training philosophy. Enjoy! Dr. Richard Mitchell presenting his insights on best practices that keep horses happy, healthy and competitive. keeps the audience engaged by sharing his insights on the biggest problems commonly found in the equine performance industry today. And Dr. Mitchell would know. He’s a practicing veterinarian with over 40 years of experience assisting in the care and welfare of many FEI level dressage horses. His candid and often humorous presentation is a must-see for any horse owner, rider, coach, and caregiver. Dr. Mitchell’s mission is to improve the longevity of equine athletes by sharing his experiences and knowledge of the practices that have been proven to accomplish this. This Video lecture presested to the membership is the complete package of all aspects of health that must be managed to insure your horse happily performs for as long as he can. Whether you are riding in the FEI ring or the back yard, Dr. Mitchell’s knowledge and experience can save you time, money, and heartache in preventing illness and unsoundness. Moreover, he covers the key practices, current treatments and latest research that ensures any horse is given the best chance to perform at its capacity. Horses need high quality forage. Find the best you can and build a balanced diet with forage as the staple. Ulcers, which develop in competition horses due to travel and show stress, can be mitigated when horses eat more frequently. Know your local vaccination requirements and get familiar with FEI and USEF regulations as to when to schedule boosters. Your show success depends on timely administration of all required vaccines. A properly balanced foot is necessary for optimal performance. Assess your horse for unsoundness frequently – preferably by a professional. Surprising new research shows lameness is often undetected by riders, trainers, and coaches. It is imperative the beginning of training is a slow and steady process, as bones and cartilage need time to adapt to the work. Training routines need to be varied to reduce the incidence of repetitive injuries – which are more common than once though. There are a lot of therapies that can keep your aging competition horse winning in the ring. Dr. Mitchell covers the range of options from medicines and supplements to shock-wave therapy and new injection technologies that can all be used to reduce pain and inflammation. 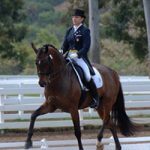 DressageClinic.com is pleased to present Jennifer Kotylo who guides us with her clear, engaging presentation at the USDF Annual Convention into improving the movement of your body to best communicate with your horse. Jennifer is a Movement and Body Awareness Specialist for Equestrians based out of Chicago, U.S.A.. She graciously shares her deep understanding of the human body and its influence on the horse. No doubt, Jennifer’s wisdom in human body movement will elevate your thinking of how you sit and move in and out of the saddle. Using diagrams of the spine, 3-D images of the pelvis, and on-stage demonstrations, she deconstructs our most important tool for communicating with our horses: our body. She states through the lecture ”we need to create throughness in ourselves bearing in mind a key message which simply is this: throughness is having a smoothness in your movement". Step by step, Jennifer lectures about the rider's anatomy of the body and enlightens us on developing our effectiveness to become positive and successful riders. Jennifer's meathod to bringing us her body awarness knowledge is clear and organized. Her presentation in this video lecture is full of pictures, stories, videos and other vital information for all dressage riders to take note. Best of all, Jennifer shares her techniques and exercises interactively with the audience making it fun to learn. You will likely find that you will be following along as you are watching the video, performing the exercises on your way to becoming transformed rider. You will be excited and literally skipping to your next ride with more suppleness and awareness of your body and dressage goals. By covering the anatomy of the spine and the pelvis, one gains the importance of becoming "body aware" and in this awareness, we can begin understanding the importance of managing our bodies correctly in order to best communicate and educate our horses.. Whether you are on the horse, walking your dog or even watching this video, Jennifer will transform your thinking on the power and grace of your body and gives you the techniques to create oneness with your horse. Buy your tickets for 2016 in advance now and save upto 20% discount if you are a member to DressageClinic.com. Click here…Buy Tickets to visit our Ticket Center for the Global Dressage Forum North America 20156 and take advantage of great savings. For those of you who are interested in a Memorable Dressage Experience at the highest levels of education for the training and development of dressage horses and riders, some of the world’s top international riders, judges and trainers have united to present on-stage arena demonstrations, discussions and lively panel interactions. During the event there is plenty of shopping, great food and lots of dressage fun as people from all over the world descending onto the Jim Brandon Equestrian Center in sunny West Palm Beach, Florida. Come to audit the GDFNA Master Classes which take place in all the outside rings of the Los Angeles Equestrian Center immediately prior to the official opening of the Forum, offering opportunities to dressage riders to have a private lesson with one of our GDFNA educators presented in our program. As a VIP Ticket holder, attend the opening reception party to meet in person the clinicians, panelists, lecturers and officials held on the night before the opening day. After the program concludes on Sunday evening with the presentation of the GDFNA Life Time Dressage Achievement Award to Stephen Clarke, ALL ticket holders are invited to an after party at the International Polo Club in Wellington Florida. An evening of fun, dancing and celebration for everyone attending. Enjoy meeting your friends, meeting some of the most celebrated dressage clinicians in the world up close and personal and participating in a Dressage Experience to be remembered for ever. 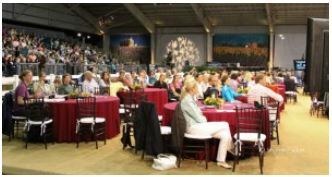 The Global Dressage Forum North America is the most important educational gathering for dressage and promises attendees the opportunity to witness the highest level of education for the development of dressage horses and riders. 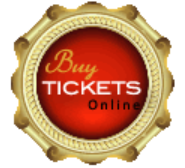 Visit our Ticket Center for Online ticket purchase. Visit our website www.GlobalDressageForumNA.com before its too late. Call 1-604-746-9222 to speak to our Customer Support agents for information and assistance. One of the most exciting parts of the program at the Global Dressage Forum North America 2014 to be presented in Florida at the Jim Brandon Center on February 15, 16 is the lecture of Terry Ciotti Gallo who will be lecturing on Understanding the Freestyle with Betsy Steiner riding a Freestyle as an example during the lecture. Betsy Steiner is one of the world’s foremost dressage trainers and teachers and during the lecture, Betsy will come out with her Grand Prix horse to ride her Freestyle that was actually prepared by Terry Ciotti Gallo. Terry will lecture on the intricacies and complexities of preparing Freestyles and at the end of the lecture, Betsy will join Terry on stage to discuss the Freestyle that was just ridden. Don’t miss out on this memorable opportunity to attend the Global Dressage Forum North America presenting some of the world’s top international dressage educators on stage with demonstrations, interactive debates with the panelists and much more. There is limited seating left so buy your tickets now before its too late. Visit the Online Ticket Center for online purchase. 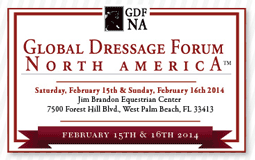 The Global Dressage Forum North America to be held in Florida on February 15, 16, 2014 not only presents in depth educational sessions on stage and in the arena with demonstrations by the world’s top international dressage trainers followed by interactive panel discussions. The program includes colorful and beautiful entertainment with the presentation of the Lion King performed by KYB Dressage and Yvonne Barteau in a lavish Pas de Deux with costumes and invigorating choreography. Get ready for a most in depth educational gathering for the training and development of dressage horses, with lots of fun, shopping, entertainment with autograph signings in the warm Florida sun. Buy your tickets now before its too late. Yvonne Barteau is a lifetime horsewoman with a unique and varied background. Her riding experience began in the hunter jumper world followed by seven years on the standardbred and thoroughbred racetracks of America and Canada eventually becoming a trainer in that field. 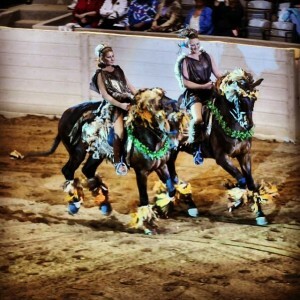 Yvonne then spent a number of years in northern Florida retraining problem horses before she met her husband Kim Barteau who was the head trainer at the Arabian Nights Dinner Theater in Orlando Florida. She joined the company as Principle Trainer and eventually became the Director of Entertainment Operations and a Feature Performer in the Nightly show. Dressage then became her lifetime passion and she and husband Kim founded KYB Dressage fifteen years ago where they have finished over a dozen horses to the Grand Prix level. In 2007 Yvonne’s book on Horse Personalities Ride the Right Horse published by Storey won the Equine Book of the Year Award and she has since given many lectures and clinics on the subject of understanding equine temperament and how it can enhance your relationship and communication pattern with your horse. Still quite interested in Equestrian Art as entertainment Yvonne and family continued doing equine exhibitions around the country and either Kim or Yvonne have appeared at many Equine Affaires, Equitana USA, Madison Square Gardens and the TODAY show just to name a few. 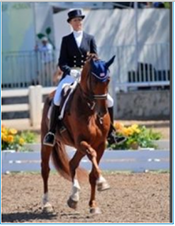 Now based at Ginna Frantz”s Grand Prix Equestrian in Maple Park Illinois Kim and Yvonne along with their family and crew are finding a balance between competition dressage and equine entertainment. Click on the Banner to Visit the Video Library for Each Trainer. In response to last year’s popularity of the GDFNA 2013 Master Classes, the Global Dressage Forum North America 2014 is proud to offer an opportunity for dressage riders to have a private lesson with the GDFNA Clinicians at the Jim Brandon Equestrian Center as part of the Global Dressage Forum North America Master Class Series. 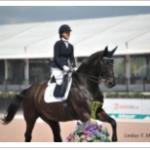 This series of Master Classes will be conducted simultaneously in the outdoor rings at the Jim Brandon Equestrian Center in West Palm Beach, Florida in the days leading up to the Global Dressage Forum North America being held Feb 15, 16, 2014. Beginning February 12th – 14th, Christilot Boylen, Tinne Vilhelmson with Bo Jena, Arthur Kottas, Conrad Schumacher and Christoph Hess with Eckart Meyners, will be giving private lessons for interested students at the Jim Brandon. All strengths and levels of dressage riders are eligible to attend. A 7-year old girl with her pony was given the thrill of her young life when she received a lesson from Ingrid Klimke at last year’s 2013 GDFNA. To continue the tradition, classes are on a first-come, first-serve basis and verified ticket holders of the GDFNA may audit the courses at no charge. Demand is high, with limited space available for classes with our top international clinicians. As an indication of the enthusiastic response to the level of education being offered this year, the Master Classes for Stephen Clarke were an immediate sell-out. For scheduling, reservations and more information for the 2014 Master Class Series with Christilot Boylen from Canada, Conrad Schumacher or Christoph Hess with Eckart Meyners from Germany, or Tinne Vilhelmson and Bo Jena from Sweden, please contact our GDFNA Master Class Coordinator at 1-561-312-7636 (text or voice). Interested students may also email inquiries to GDFNA@GlobalDressageForumNA.com with MASTERCLASS in the subject line. Be sure to take advantage of this once-in-a-lifetime memorable & educational opportunity. Lessons are now available to dressage riders at the Jim Brandon Equestrian Center in the days before the Global Dressage Forum North America is held in West Palm Beach, Florida, so please don’t miss out. In addition, if you still haven’t bought your ticket to the Global Dressage Forum NA for Feb 15 & 16th and wish to attend, the General Admission Seating is still available by calling 1-604-746-9222 or visiting our website directly to make your online ticket purchase. February 5th is the deadline for the Final Savings Discount Coupon USDF4GDFNA to be used for a 15% discount off tickets. 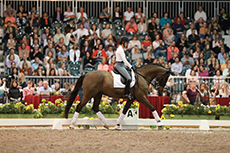 Don't miss out on this memorable educational gathering featuring the world's foremost dressage trainers. 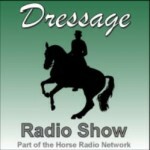 Listen to an in-depth radio interview by the Horse Radio Network Dressage Radio with GDFNA Executive Director Andreas Stano explaining updates and interesting information about the happenings coming up. 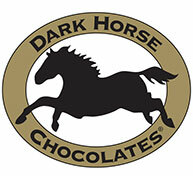 We applaud our sponsors for their dedication to Dressage education. Thinline Products, Borne Saddlery and Schleese Saddlery, Marydell Farm and Trafalgar Square Press, The Balimo Chair and DressageClinic.com. Last Month Savings discount of 15% off tickets now on sale online until January 31, 2014 If you are a member of USDF use the promotional code USDF4GDFNA during the ticket purchase process by visiting our GDFNA Online Ticket Purchase Center (Click Here). 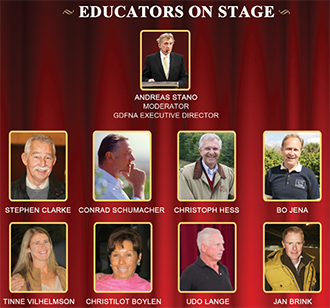 The 2nd Annual Global Dressage Forum North America 2014 is presenting the highest profile "educational gathering for dressage training", ever to be held in North America. With USDF as an Education Partner along with other GMOs (Dressage Federations), the GDFNA, as it is known by many, is encouraging dressage riders from across the U.S. and Canada, as well as the South Americas, to come and participate in this educational gathering presenting, on stage, Dressage Education in its highest form. Buy your tickets now as seating is limited as tickets are running out quickly and the last round of our Final Month savings tickets with a discount of 15% discount off ticket prices. Tickets are available now until January 31, 2014 Use USDF discount coupon code USDF4GDFNA. All capital letters. To buy tickets visit www.GlobalDressageForumNA.com or if you have any questions call the GDFNA 24/7 support line 1-561-909-7621 to speak with a GDFNA customer support representative. The 2nd annual gathering of the 2014 Global Dressage Forum North America (GDFNA), will be held on Saturday February 15 and Sunday February 16 2014 at the Jim Brandon Center in Wellington (West Palm Beach) Florida presenting on stage demonstrations, lectures, discussion interactions between clinicians, audience members and panels consisting of some of the world's most recognized dressage experts and educators, in a two day extensive program featuring 10 of the world's foremost international dressage trainers, 4 dressage expert lecturers and 2 panels consisting of some of the world's internationally recognized trainers and judges plus shopping, connecting and lots of fun in the Florida SUN. The stars leading the 2nd annual GDFNA 2014 are expert horseman and international judge Stephen Clarke, international rider Jan Brink, Sweden's super star Tinne Vilhelmson-Silven with Sweden's Olympic Coach Bo Jena, world renowned German dressage teacher Conrad Schumacher, dressage seat and balance and seat expert Eckart Meyners with Christoph Hess, Canada's super star 6 time Olympian Christilot Boylen with Germany's foremost dressage trainer Udo Lange. The Lecturers are: author of multiple books on correct riding Susanne von Dietze, Freestyle expert Terri Ciotti Gallo, equine expert Jochen Schleese and one of the most admired experts for centered riding Sue Leffler. The Panelists debating on stage with clinicians and lecturers are U.S. international rider and judge Charlotte Bredahl, expert horseman Volker Bromann, U.S. international trainers Kathy Connelly, Pam Goodrich, Anne Gribbons, Mette Rosencrantz, Betsy Steiner, George Williams, three time Olympian from Canada Leslie Reid along with the international ambassador for dressage education Arthur Kottas. Florida reigns as the horse show and educational capital of the world during the coming 2014 winter season. 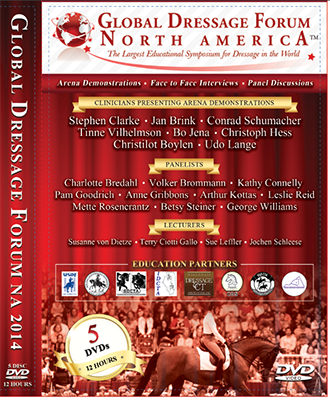 Don't miss out on this important educational opportunity on February 15 16 at the Global Dressage Forum North America 2014. Make plans now to take advantage of the savings. Tickets may be purchased online or for questions dial 1-604-746-9222 for questions or assistance. Use Discount Coupon Code USDF4GDFNA during your online ticket process. The USDF has announced that it is acknowledging the Global Dressage Forum North America to be held this coming Febraury 15, 16 2014 for credits to attendees for its USDF University Accreditation Program. This means that participants of the USDF University who attend the GDFNA 2014 in Florida will receive high credits for their attendance and participation in the two day intense program of speeches, debates on the training of dressage horses, arena demonstrations, face to face discussions with the clinicians as well as receptions. For further information regarding the acquisition of credits, please contact the USDF department for the Accreditation Program. (Phelps Media Group) – The second day of the Global Dressage Forum North America (GDFNA) was packed with lectures, demonstrations and interactive panel discussions presented by a “Who’s who” of dressage clinicians, experts, judges, riders and competitors. The GDFNA, held at the Jim Brandon Equestrian Center January 28-29, was presented by DressageClinic.com and Wellington Classic Dressage. Tuesday’s clinicians included Stefan Stammer, Bo Jena, Ingrid Klimke, Dr. Hilary Clayton and Wolfram Wittig. 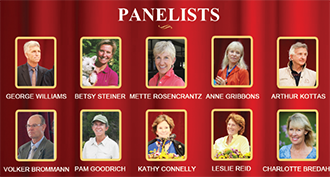 Dressage superstars Anne Gribbons, Kathy Connelly, Betsy Steiner, Leslie Reid, Jan Ebling, Felicitas von Neumann-Cosel, Christoph Hess, Stephen Clarke, Wim Ernes, Gary Rockwell, Lendon Gray and Sue Blinks were featured panelists. “I’m honored to be part of the first annual GDFNA and to welcome so many top international riders, trainers and panelists,” said Noreen O’Sullivan, Managing Partner of Wellington Classic Dressage. The program began with Stefan Stammer, a physiotherapist and equine osteopath from Switzerland, who discussed biomechanics. He suggested the audience “think about what happens with movement, with weight, with levers and angles” when considering the horse’s physiology. A long-line demonstration followed with Bo Jena, one of the foremost experts in the field. Jena focused on relaxation and worked on transitions. “Small half-halts and the quick giving of the reins are very important for the horse-in long-lining too,” he said. “The outside rein is the key.” Panel members Anne Gribbons, Kathy Connelly, Betsy Steiner, Leslie Reid, Jan Ebeling and Felicitas von Neumann-Cosel discussed the demonstrations and praised Jena’s expertise and calm assertiveness. Ingrid Klimke continued the program and spoke about training the young horse. She emphasized essential attributes for riders: control, strength, quiet hands and elasticity to move in the rhythm of the horse. “If you are flexible, the horse is able to understand your aids,” she explained. Klimke then rode a 5-year-old Hanoverian stallion she met for the first time that afternoon. After taking up a soft, steady contact, she used changes of rein to make sure the young horse was supple on both sides. She confirmed that his reaction came from her seat first and explained she wants a sensitive horse that answers to her aids and that goal requires a sensitive rider as well. She believes in performing the basics for four to six years as building blocks for upper level work and emphasized using seat, then leg, then hands, when applying aids. “The horse is the best teacher, but you must really open your heart and feel,” she said. Dr. Hilary Clayton’s lecture on maintaining soundness in dressage horses focused on damage to suspensory ligaments. “In our dressage horses, suspensory injuries are much more common,” she said. She said that risk factors include conformation, lack of exercise early in life, age, poor shoeing, footing and the type of work. Then, Noreen O’Sullivan, from Wellington Classic Dressage, and Andreas Stano, organizer of the GDFNA, presented the first GDFNA Lifetime Achievement Award to Olympic Gold Medalist Klaus Balkenhol, who Stano said has dedicated his life to dressage and dressage education. Balkenhol was also the U.S. Olympic team coach. Peters acted as translator for Balkenhol, who said that he and his wife, Judith, call America their second home and that he learned a lot from being involved with the U.S. team. 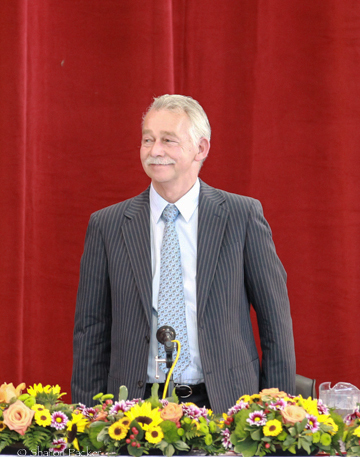 He praised the educational opportunities provided by the GDFNA. “We started this 20 years too late,” he said in German, as translated by Peters. GDFNA News: International Dressage super stars Rudolf Zeilinger and Wolfram Wittig will be presenting 90 minute segments on their theories and philosophies on the methods they use for the development of their horses during the Global Dressage Forum North America to be held in Florida January 28, 29 2013. Rudolf Zeilinger is one of the world’s most notable and successful dressage riders/trainers with numerous medals in the international dressage arena. People from all over the world seek his advice and guidance with their horses in training. Wolfram Witting is truly the professional’s professional. The most successful European riders have trained with Wittig including Isabelle Werth and U.S. team rider Jan Ebeling on his journey to the latest Olympics. Both Zeilinger’s and Wittig’s appearance at the GDFNA have created excitement and anticipation for people all over North America to come and witness these two gentlemen give their training demonstrations during the GDFNA. Other top names included in the program are Steffen Peters from the U.S., Ingrid Klimke from Germany, Arthur Kottas from Austria and Bo Jena from Denmark. These top names will be facing debate panels on the training meathods. The panel members are Lendon Gray, Anne Gribbons, Wim Ernes, Christoph Hess, Leslie Reid, Stephen Clarke, Gary Rockwell, Sue Blinks, Felicitas von Neumann Cosel, Jan Ebeling. The Global Dressage Forum North America will be held on January 28, 29 2013 and has become the climax for dressage education in North America. 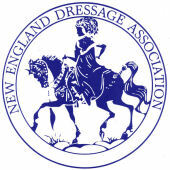 GDFNA News: As part of the two day intense program, GDFNA panelists Anne Gribbons, Kathy Connelly, Betsy Steiner, Leslie Reid, Jan Ebeling, Felicitas von Neumann will presenting a debate of questions and curiosities to world famous dressage trainer Arthur Kottas during his live demonstration for Work in Hand. 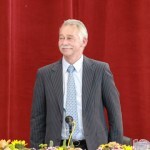 Arthur Kottas will perform a 90 minute segment with a speech on his philosophies and meathods to the training of dressage horses, a live demonstration with Work in Hand techniques followed by a debate made up of a 6 member panel and finally concluding with questions from the audience. The Gobal Dressage Forum North America will be held at the Jim Brandon Center in West Palm Beach Florida on Monday January 28, 29 2013 immediately following the CDI3* Horse Show in the same venue.